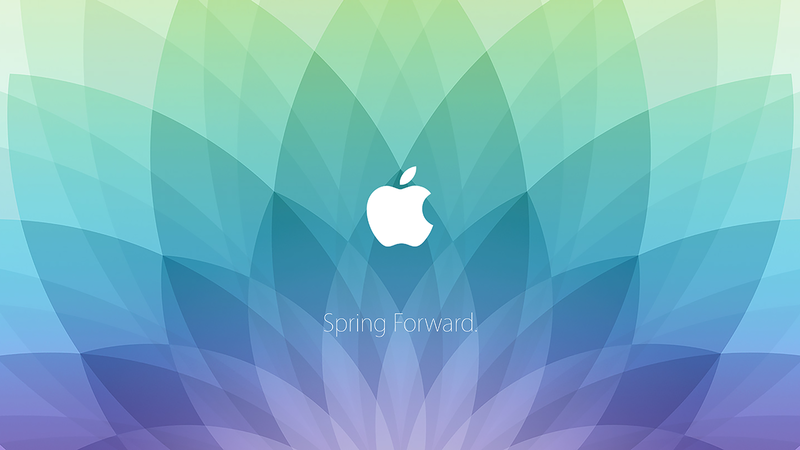 iP3: Live from Apple's 'spring forward' keynote! And that's a wrap. Thanks for reading, folks! Time to get hands-on. 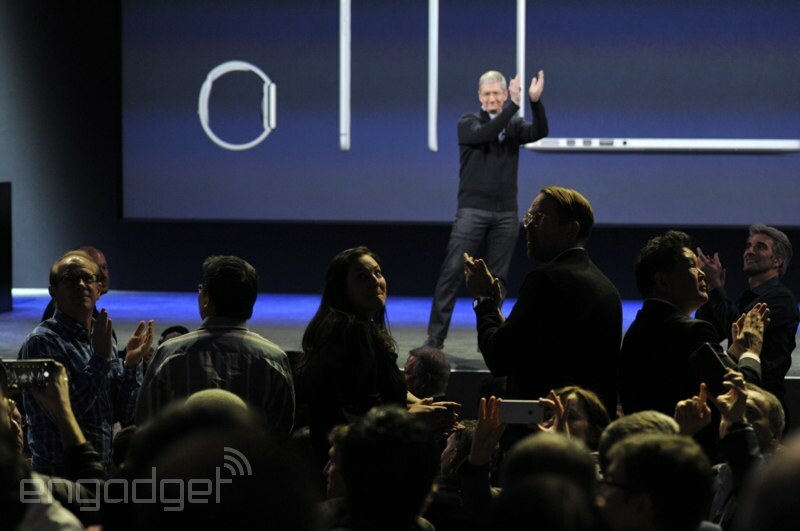 Ah, there's Craig Federighi and his beautiful hair in the front row. 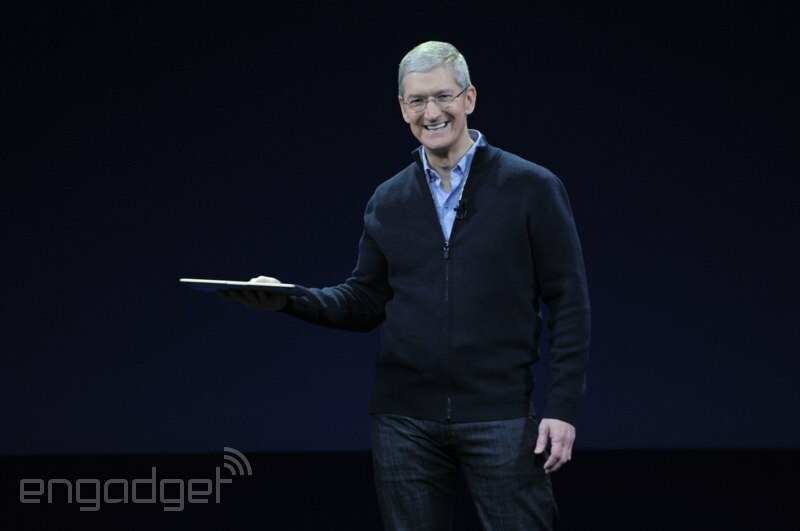 "I'd like to personally thank all of the Apple team that made today possible. What you saw today is years of very hard work in the making." 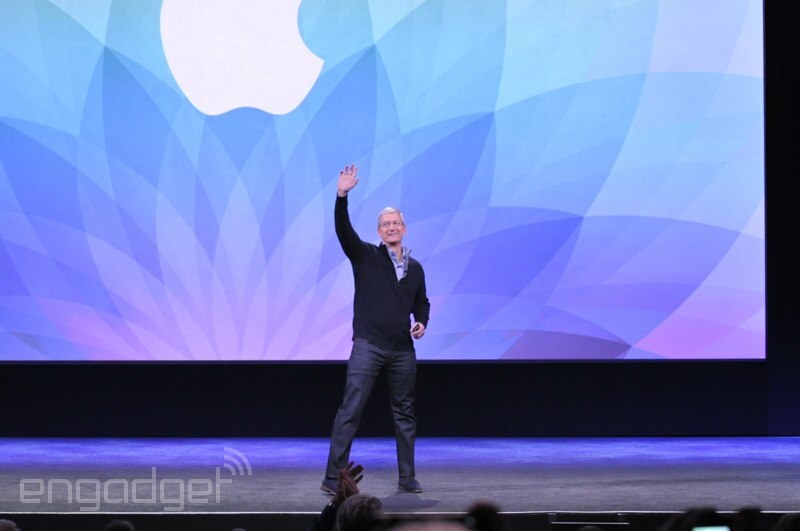 He's asking the Apple employees in the room to stand up, and there are quite a few of them. 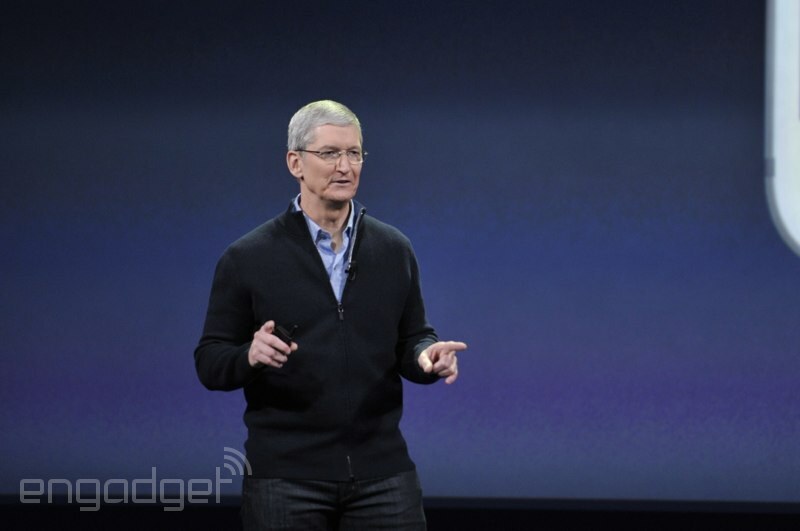 "We continue to innovate. We continue to push forward." I get the sense Tim is wrapping up here. 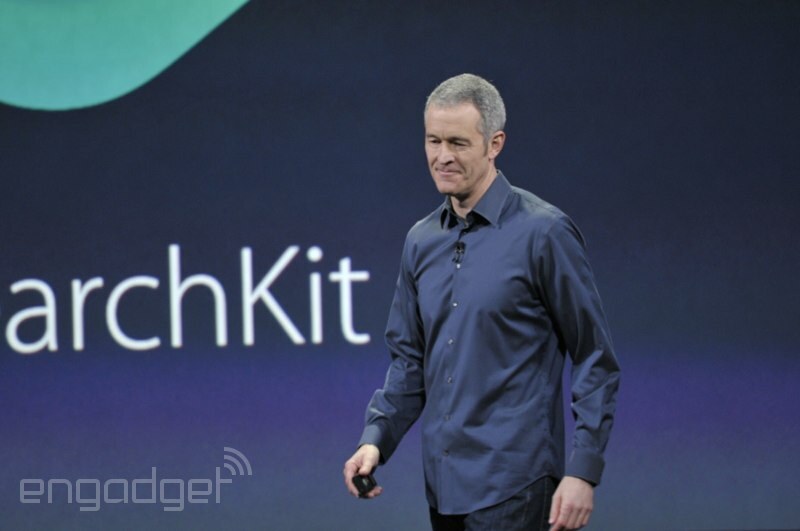 He's returning to things like ResearchKit, the new MacBook. 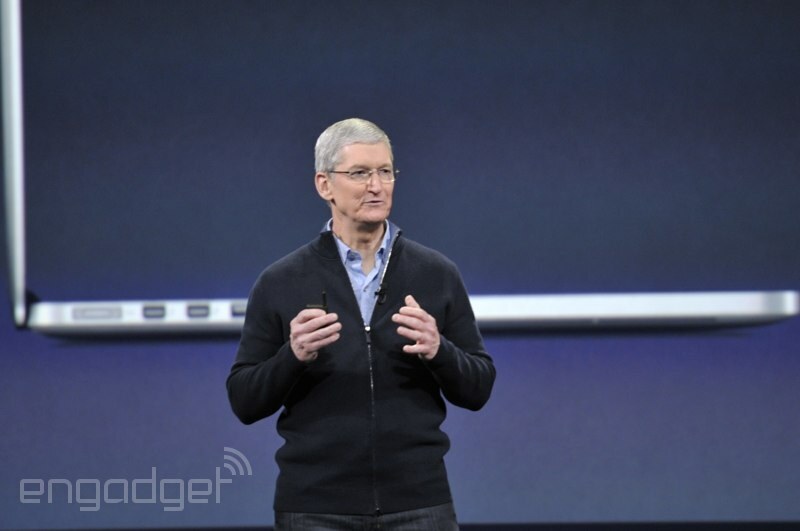 "This is what everyone in Apple is focused on -- pushing our products forward and creating a better future." 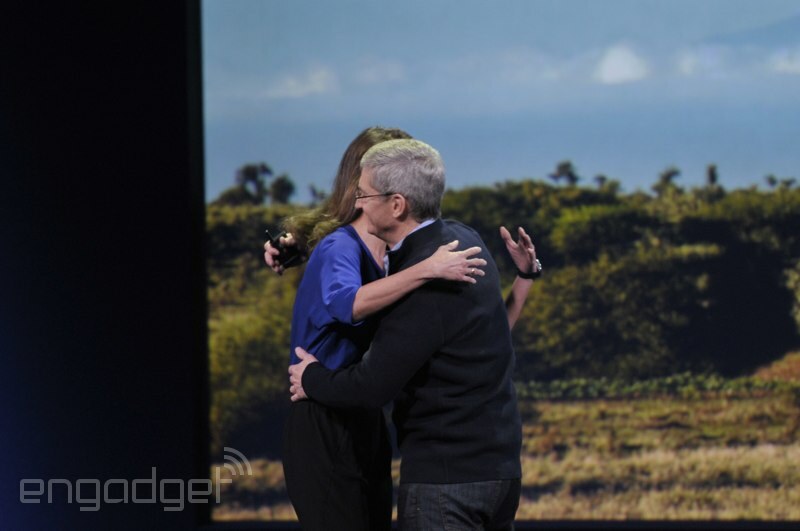 Reminds me of early iPhone and iPod touch ads, to be honest. It was about what you could do with it. Begins with an emphasis on design, but apps soon become the focus. 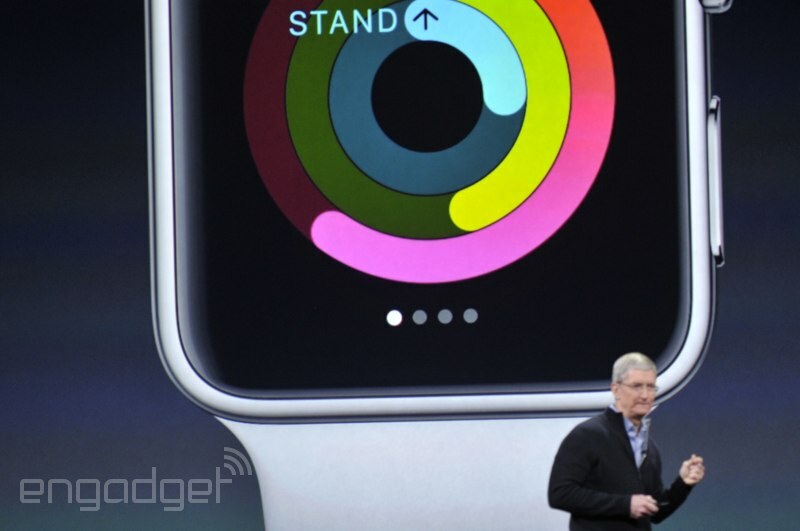 The Apple Watch is somehow the least interesting thing we saw today. Now that we've got those nitty-gritty pricing and availability details out of the way, let's watch the first Apple Watch ad, shall we? 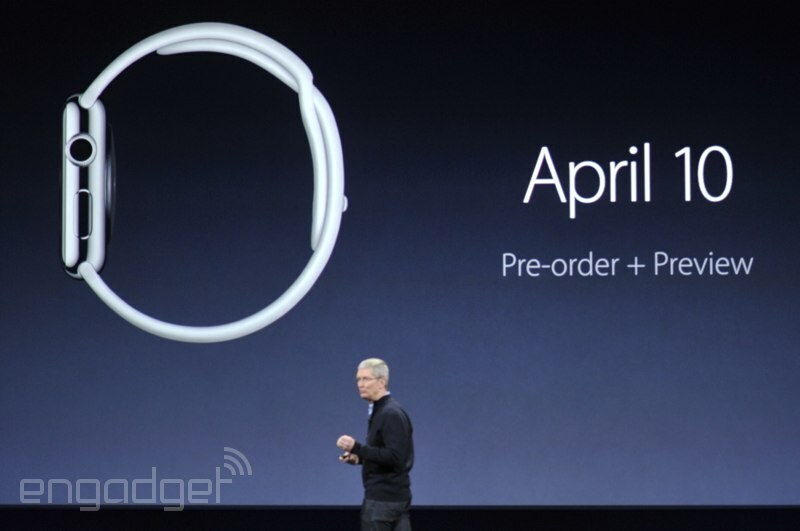 The Apple Watch will be available on April 24th. Chris VelazcoAnd in "many countries" around the world. 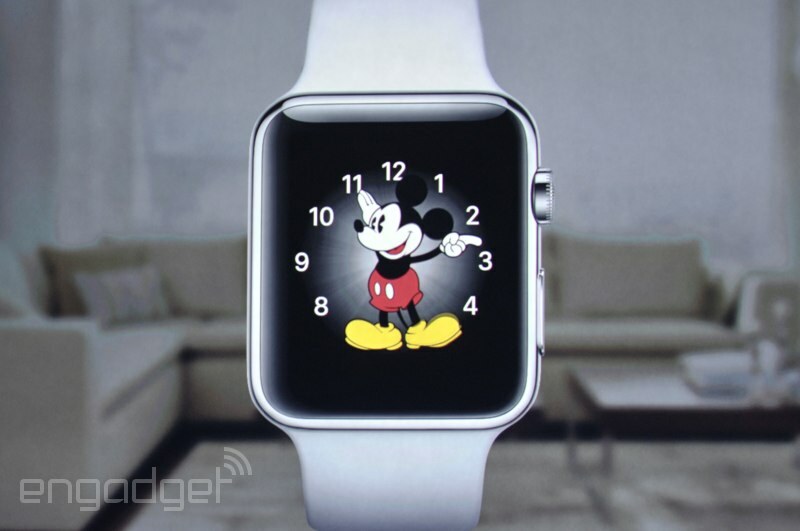 In particular, there's a "custom table" where the Apple Watch is displayed. It seems the retail staff has received some extensive training too, as you'd expect. Pre-orders begin April 10th. 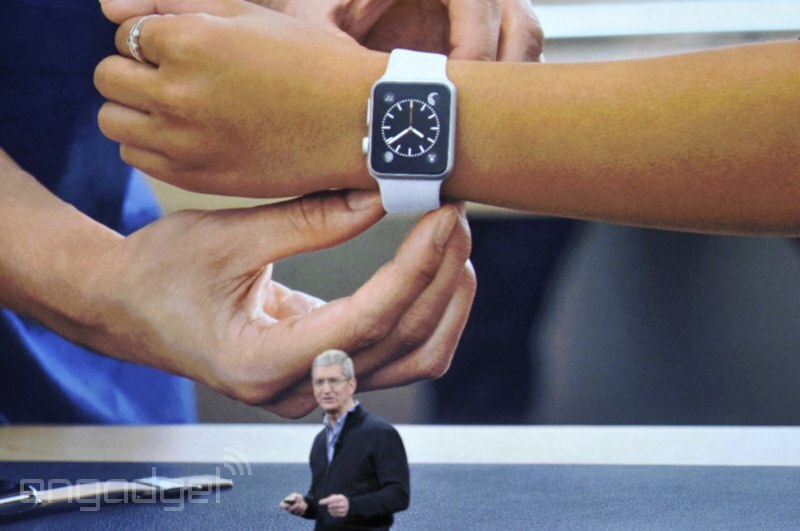 Also that day, you can try out a watch in the Apple Store. Available in limited quantities, in select stores. 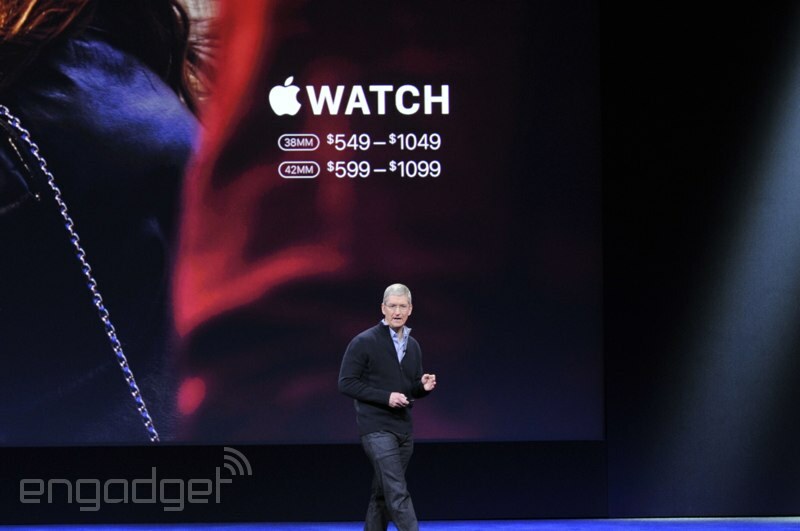 Apple Watch Edition pricing starts at $10,000. 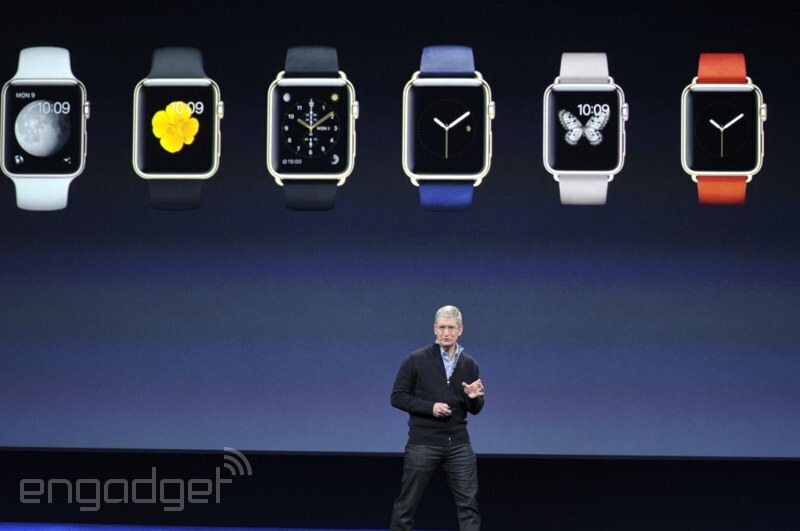 OK, Apple Watch collection pricing: the 38mm model will run between $549 and $1,049 based on your band choice. 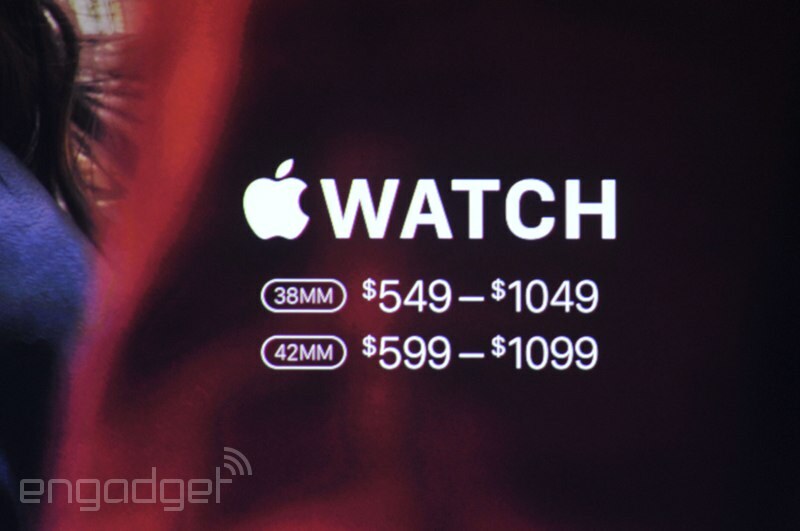 The 42mm model is $50 more. 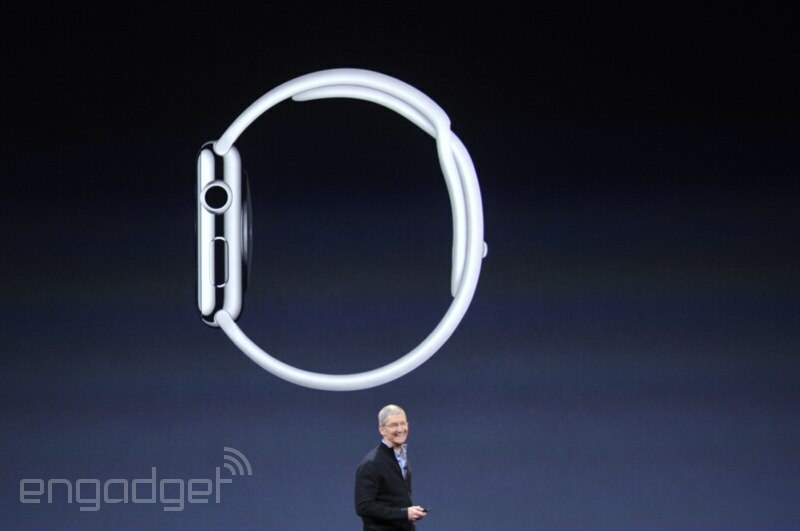 The space black version gets a "diamond-like carbon layer," too. Chris VelazcoThe finer points of the carbon layer elude me, but dang that thing is pretty. Cold forging helps make the metal up to 80 percent harder, and less susceptible to nicks and scratches. Another video taking about stainless steel. Today is a crash course in metal, people. 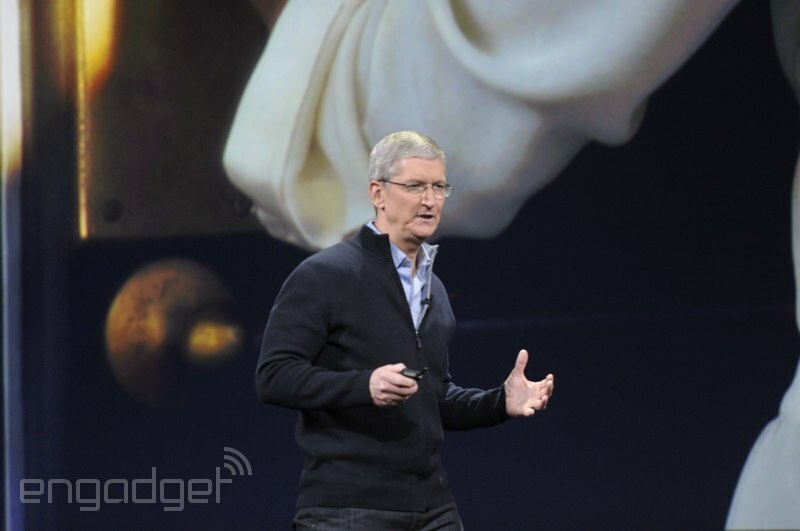 "This stainless steel is no ordinary stainless steel," says Cook. People laughed at that. 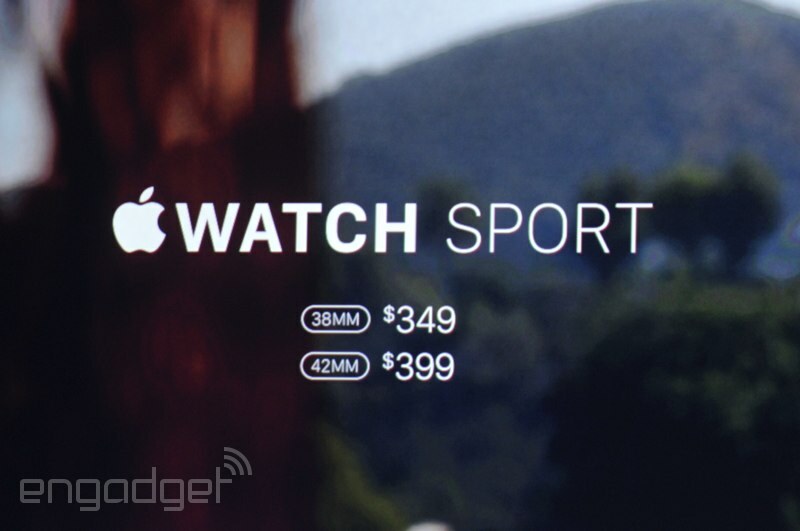 Apple Watch Sport starts at $349, going up to $399, depending on the size (in mm). 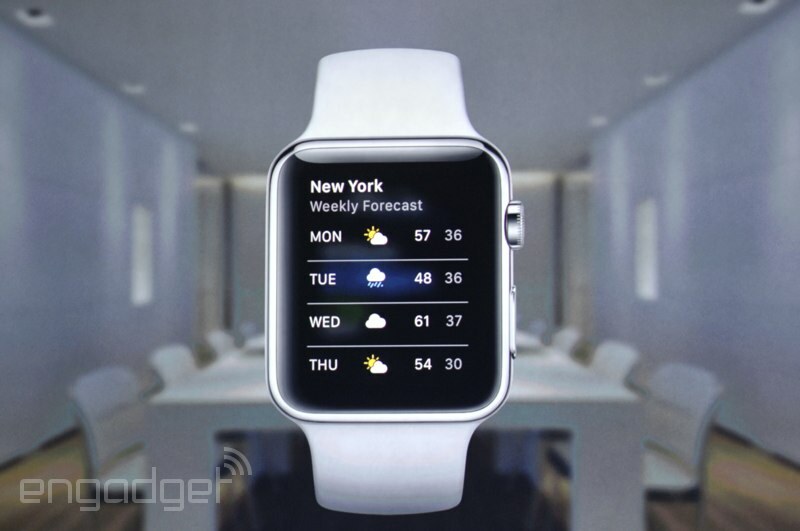 This video's diving into the specifics surrounding the Apple Watch's aluminum alloy body. Metallurgy fans unite! Now, let's talk about the three collections. 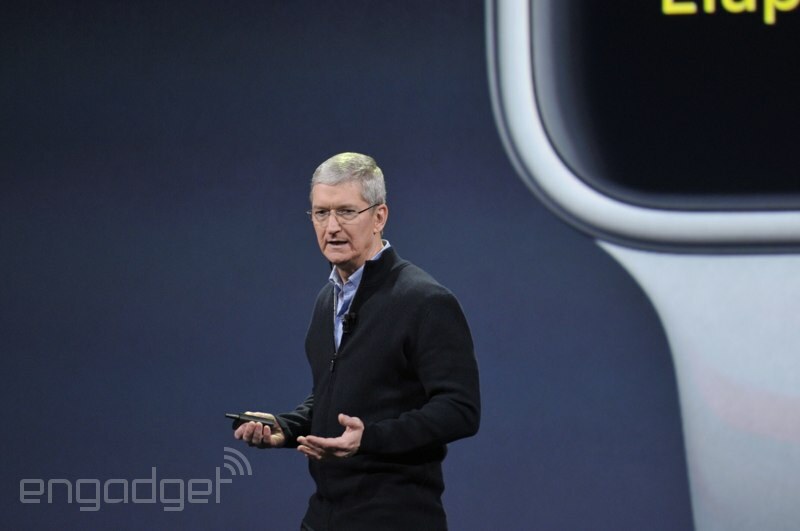 Cook is starting with Apple Watch Sport. 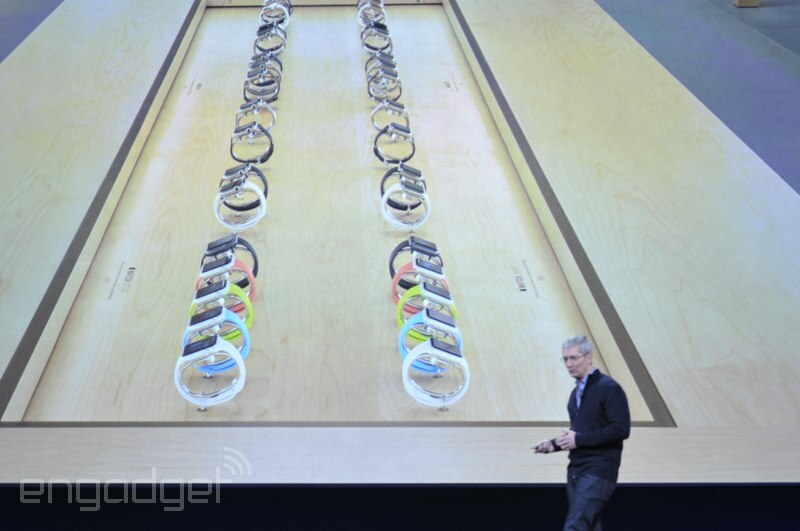 Tim is talking about the Apple Watch's battery life. In particular: 18 hours in a typical day. Dana WollmanConfirming what we already knew, which is that you will need to charge it nightly. This isn't a surprise. Chris VelazcoThough we're waiting to hear exactly what a "typical" day consists of. 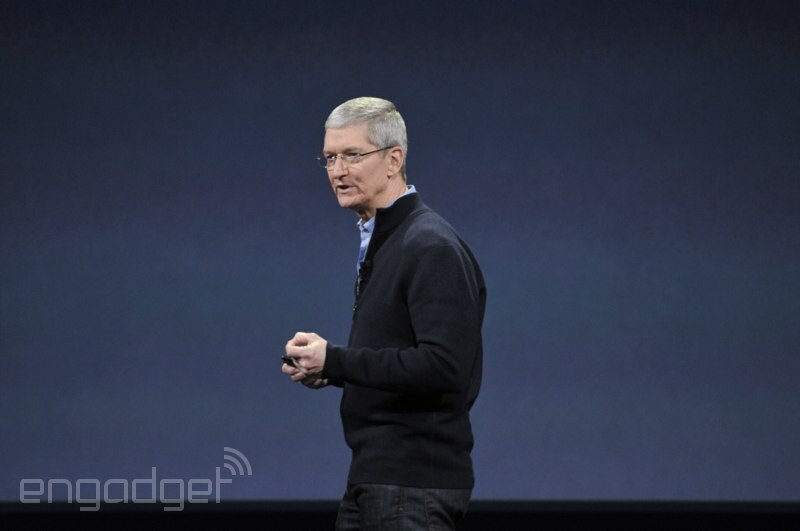 Cook just name checked iOS 8.2 -- when's this happening, Tim? 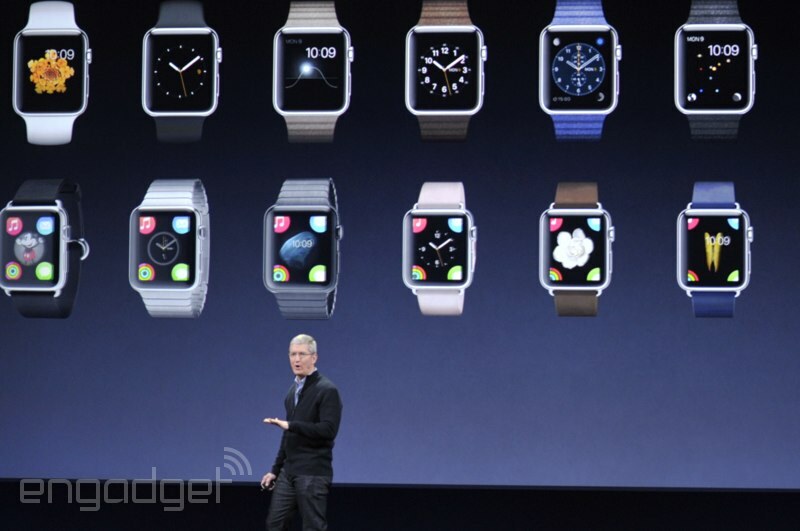 What we're seeing now is the Apple Watch portion of the App Store. 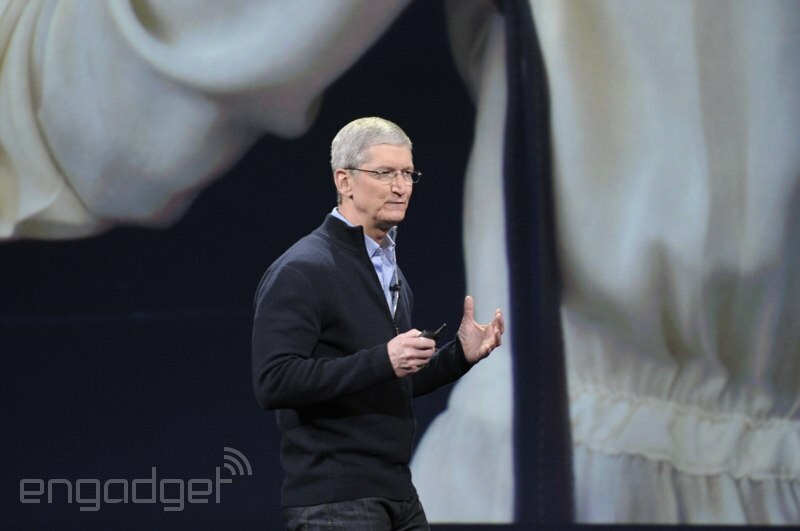 Tim Cook's back (and so am I, after a brief pause). 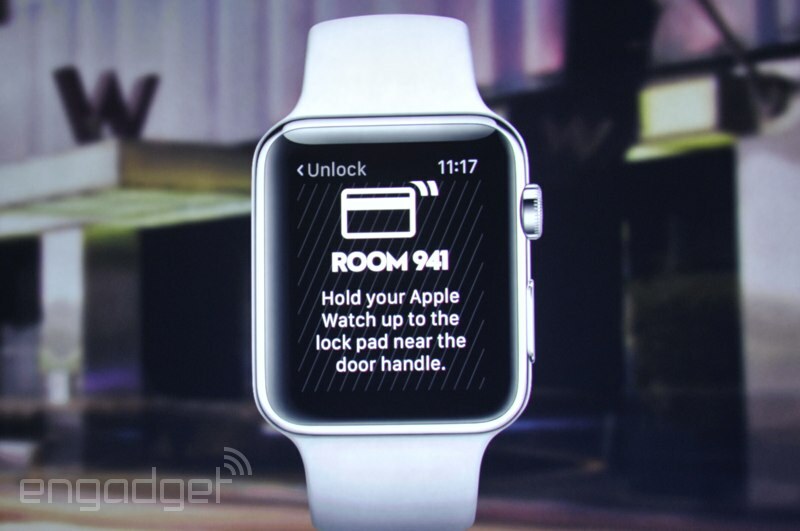 If you're down with alarm.com, you can open your garage door from your watch, and see a live feed too. 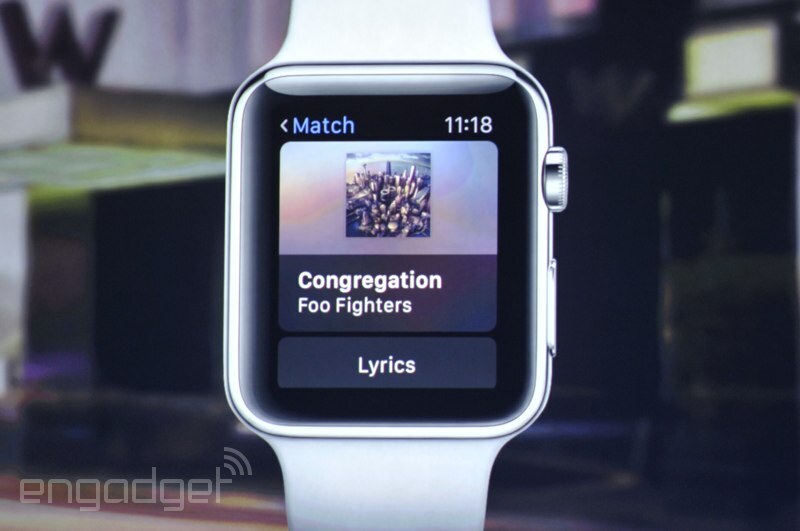 Shazam for the Apple Watch does... well, exactly what you'd expect Shazam to do. Chris VelazcoPlus lyrics, so you'll never butcher "I Really Like You" again. 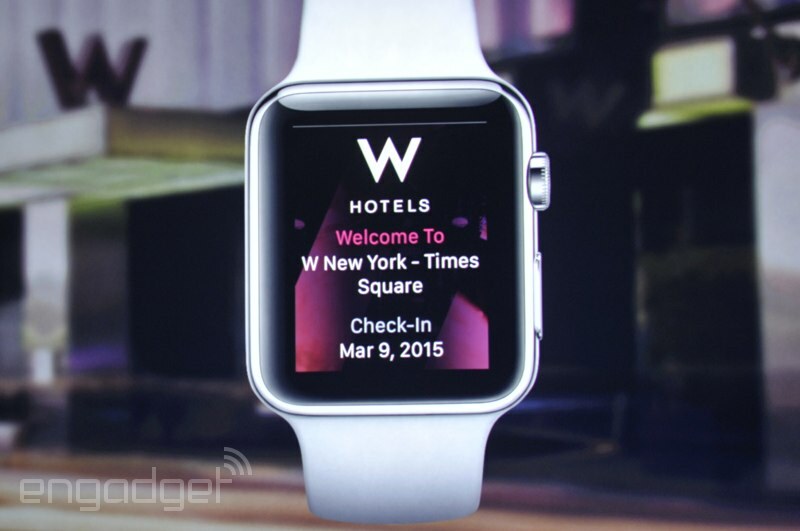 Considering the namecheck, this might be an SPG/W Hotel exclusive for now. 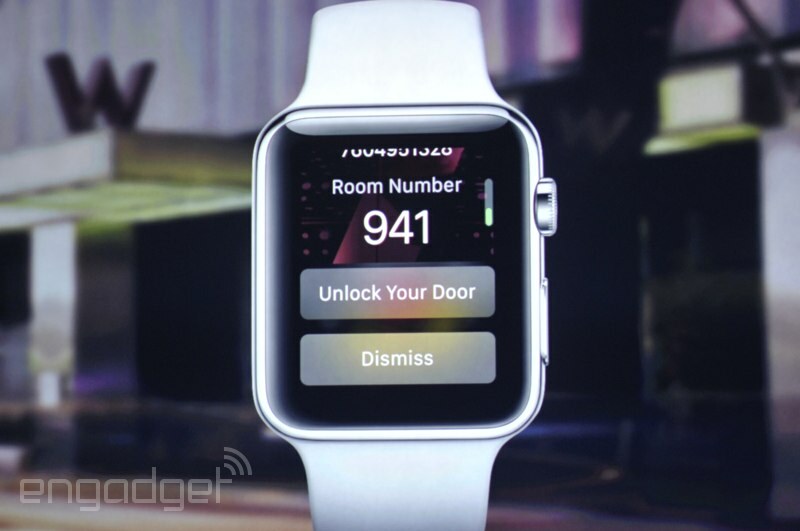 Surprise, surprise -- hotel reservation information will show up too, and if supported, you can use your Watch to unlock your door. 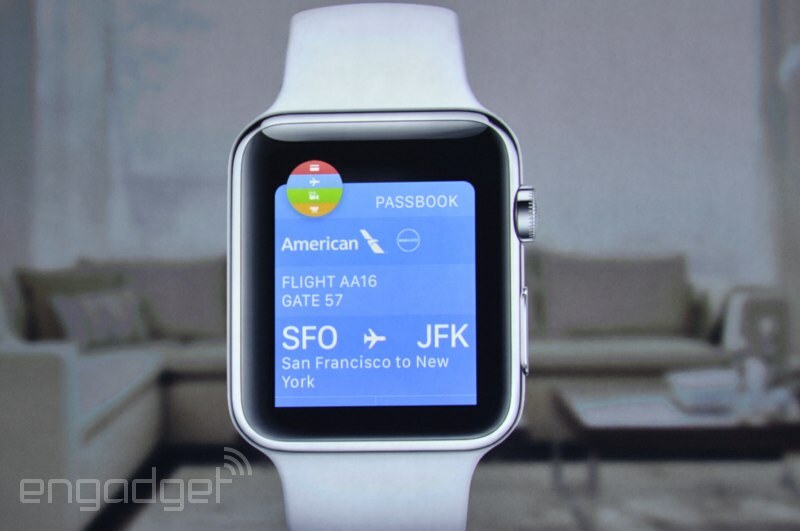 Travel buffs will see their boarding passes pop up on the Watch's face when they get close to the airport. At this rate, you might not ever need to take your phone out of your pocket again. 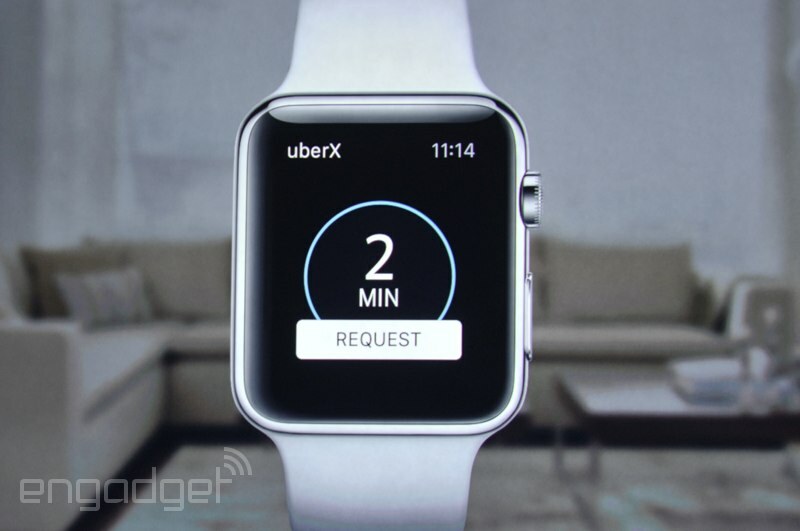 Super-simple Uber app for the watch lets you see your driver's ETA, and you'll get a tap to let you know when the car's coming. 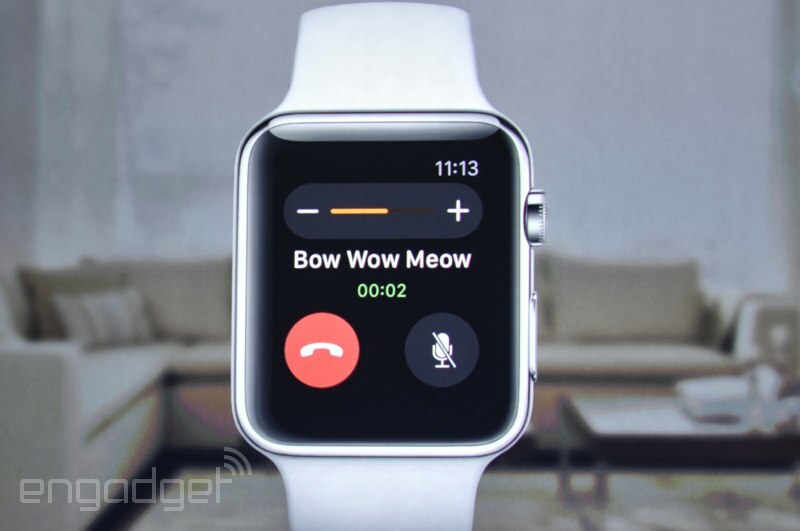 Watch communicates with iPhone over WiFi and not just Bluetooth. 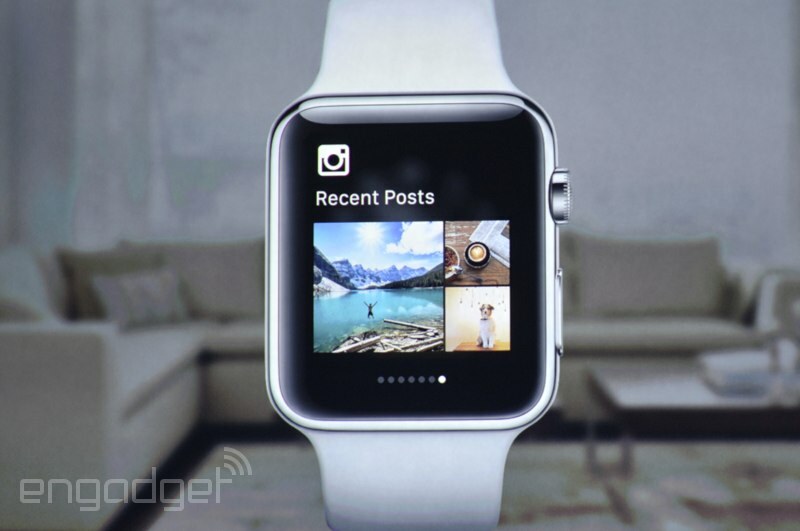 Oh, and there's an Instagram app for your Watch, because of course there is. 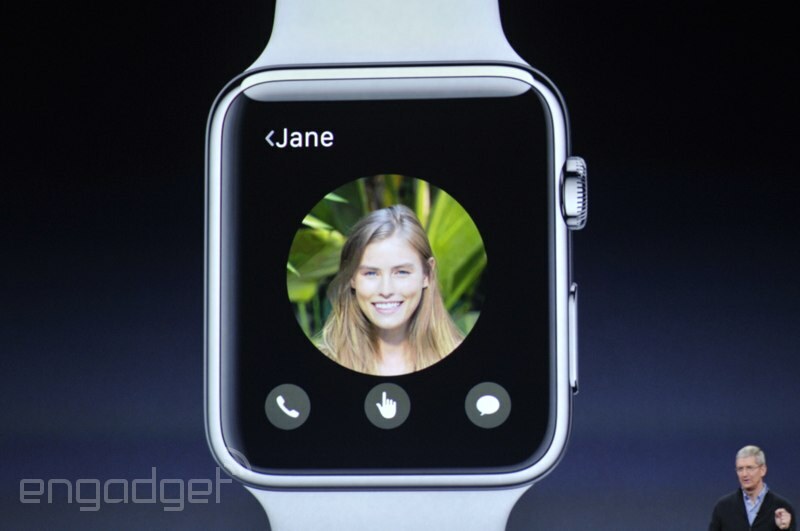 Now you can look at people's meals on your wrists, while using the VERY SAME HAND to eat your own. Welcome to the future. 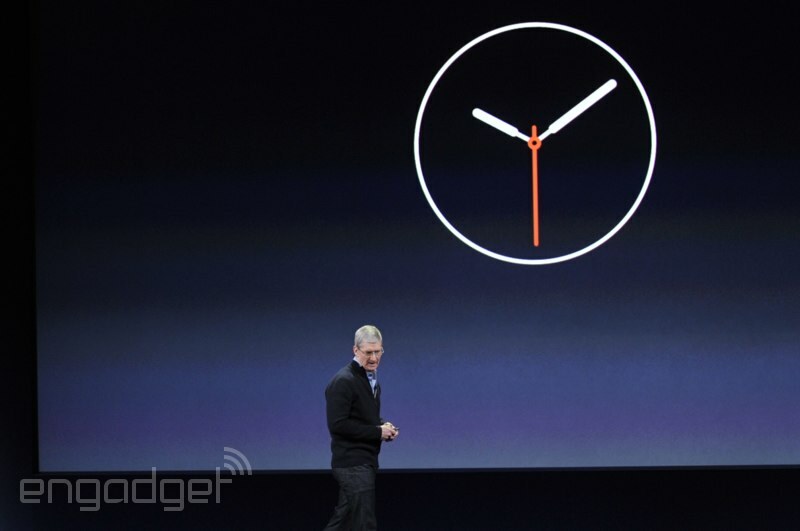 Changing watch faces involves Apple's favorite new gesture, the force press. Need to pay for stuff? 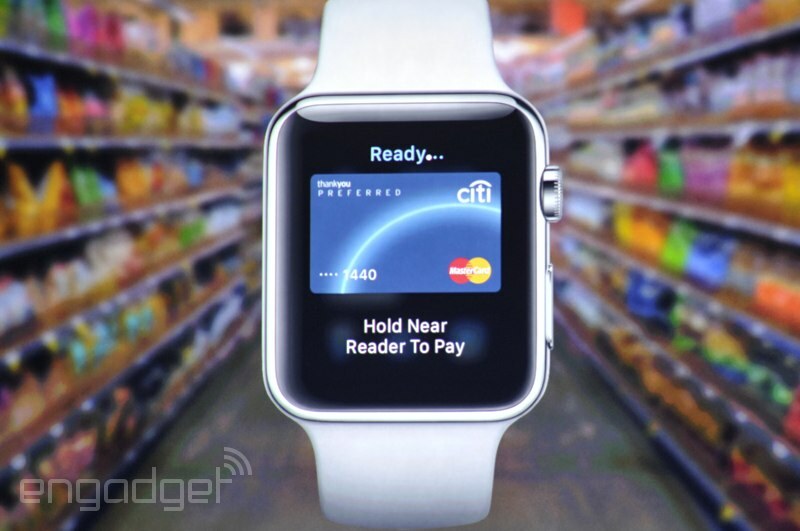 The Watch has you covered -- select a card and hold your Watch next to the POS scanner. 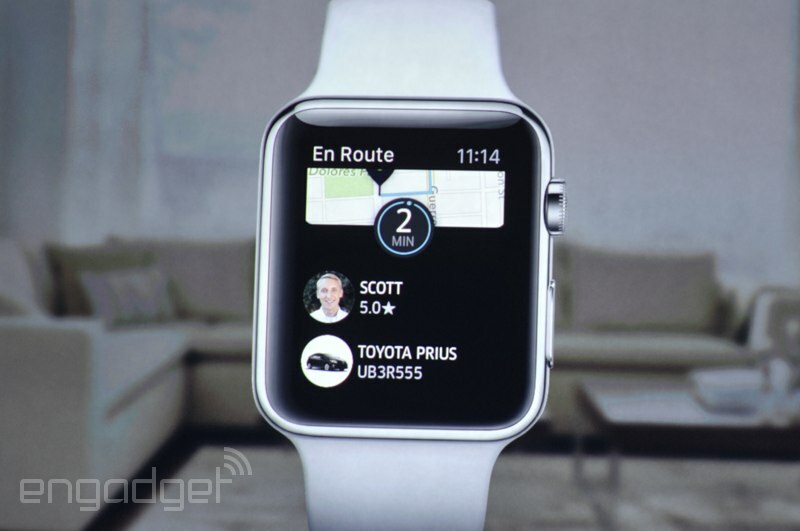 Chris VelazcoYou'll get a bleep sound and some haptic feedback to confirm your transaction. When you're being a bit sloth-like, you'll also get a reminder to get up and mosey every once in a while. 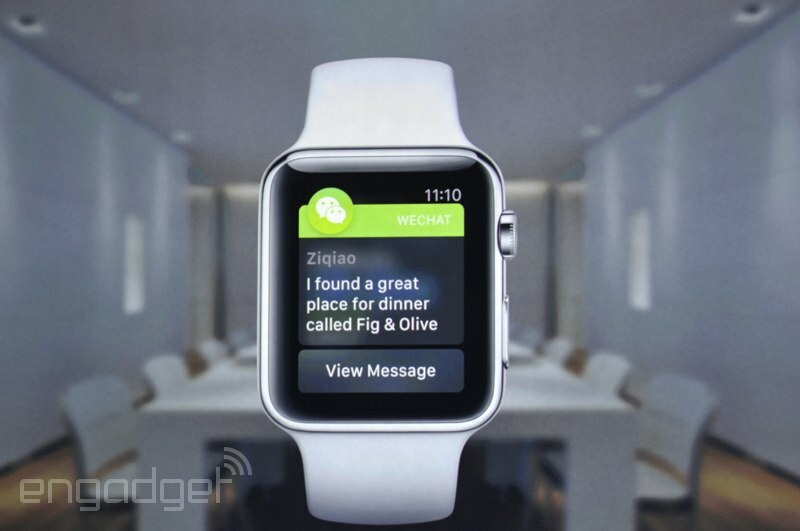 You can reply to a Wechat message (with stickers, no less!) right by tapping on your watch. Chris VelazcoAlso, no way is it that warm in New York right now. No way. 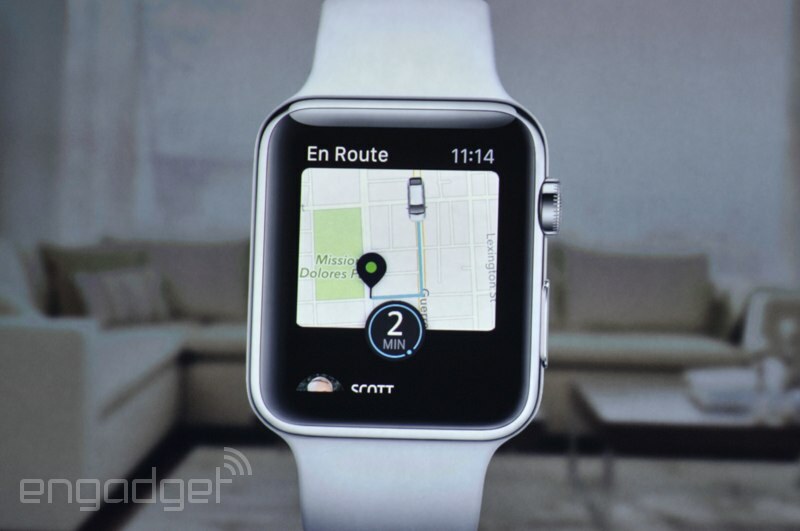 "Using the watch during the day is about brief interactions." 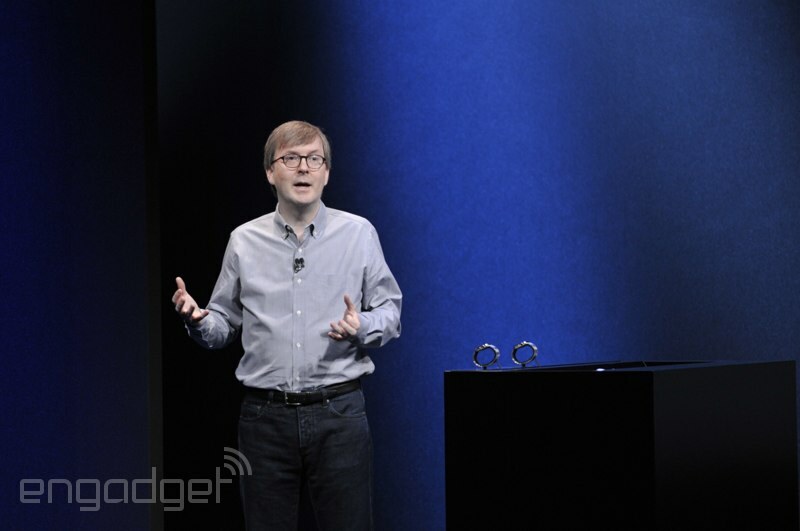 Taking the stage now is Kevin Lynch, to talk more about WatchKit. 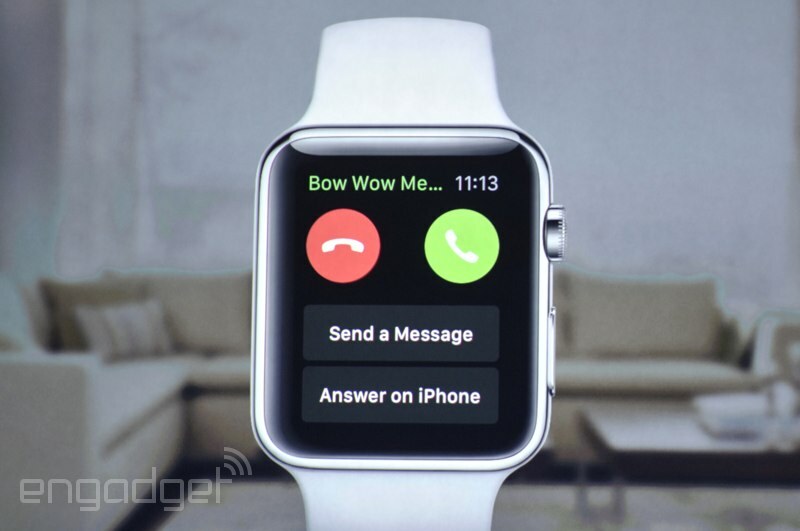 You can receive any notification that you'd get on your phone on your Apple Watch, for better or worse. Hey. Hey Tim. Let's talk battery, please. Tim adds that Christy will be doing a weekly training blog on Apple.com. Dana WollmanThat, my friends, is some fairly committed celebrity spokesmanship. Remember when Alicia Keys "repped" BlackBerry? Christy says in eight weeks she will be running the London Marathon. Trying to run a sub-four, and that Apple Watch will help her get there. Christy Turlington Burns takes the stage, to pretty hearty applause. As a runner myself, I'm curious about the battery life while working out, especially during long races, but I don't expect any answers on that today. During the race, the watch measured her distance, pace and heart rate. Like a dedicated running watch just, you know, more versatile than that. Chris VelazcoDana, can we run this? Terrence can come too. And now we're seeing video of her running said race in Africa. "Health and fitness have always been part of my life," she said. "Maternal health is the most important issue to me." 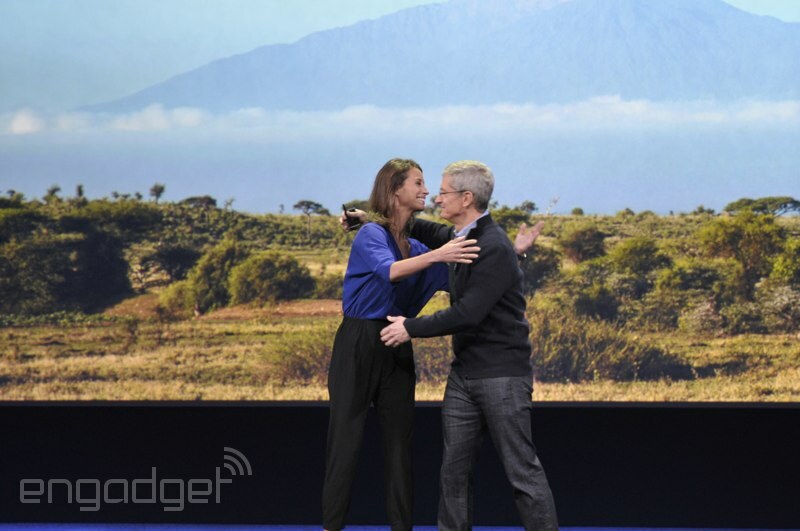 She is the first person to finish a half marathon wearing an Apple Watch, Tim says. OK, so Tim's teasing a mystery guest. She's a mother. 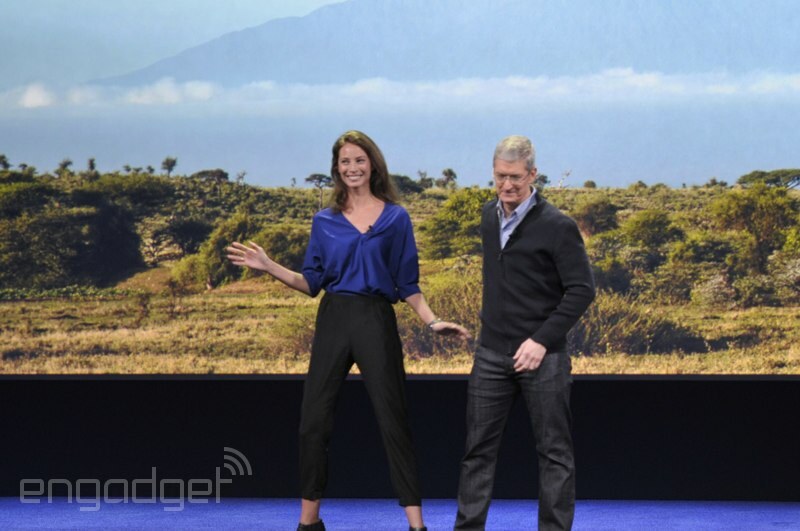 And hey there, it's former supermodel Christy Turlington Burns. Chris VelazcoI guessed Jessica Alba at first. Then Taylor Swift. MKBHD is sitting next to me, he called Michelle Obama. 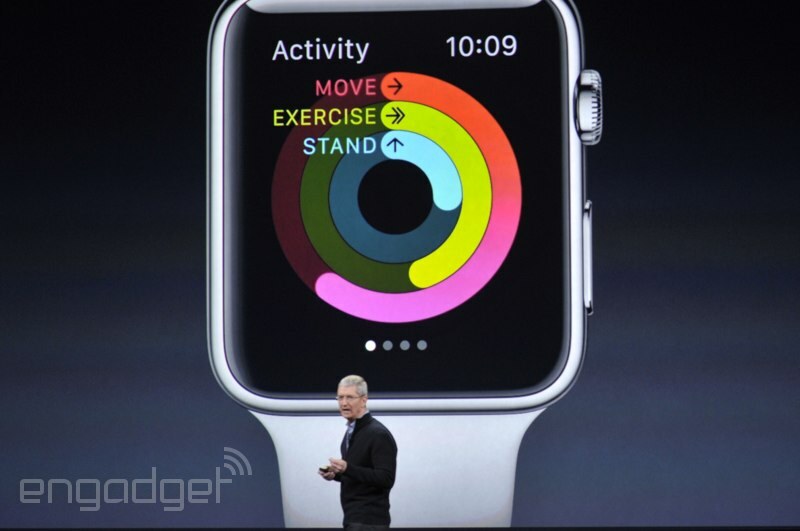 "That's a brief summary of health and fitness on the Apple Watch." There's also a workout app that works for both outdoors activities as well as various cardio machines, like the elliptical. 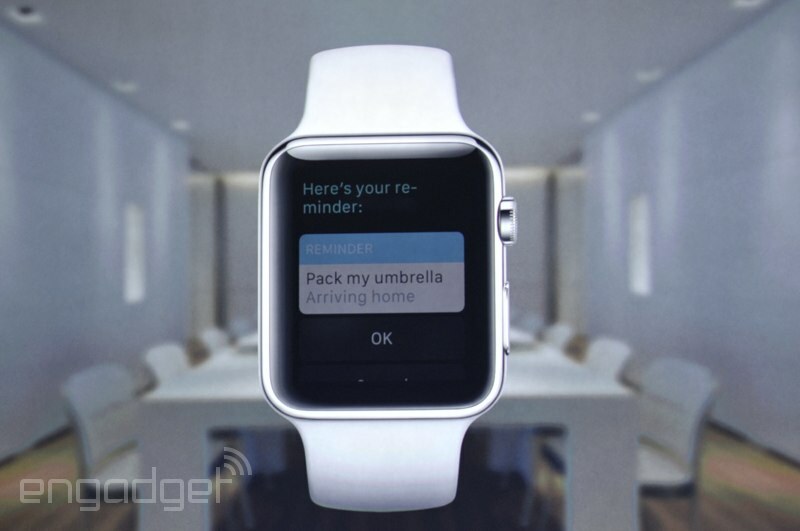 The Watch will send you reminders "like a friend would." 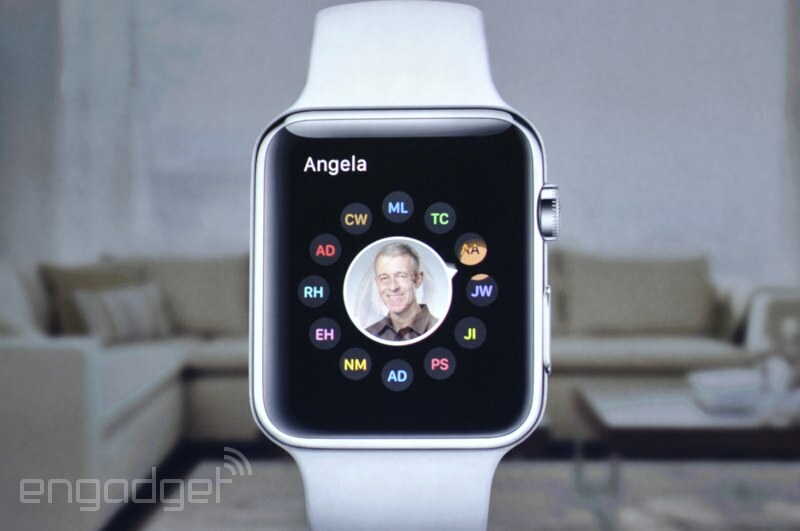 It's "like having a coach on your wrist." 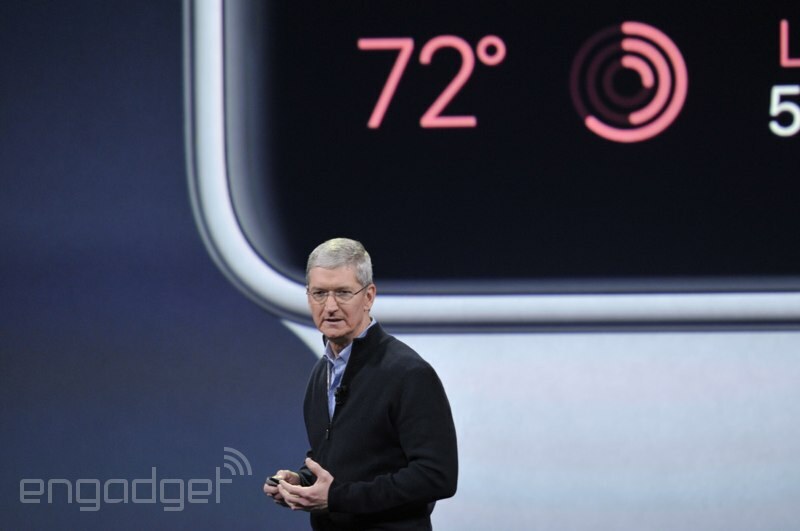 Cook's really eager to frame the watch as a person. Chris VelazcoA partner. A buddy. A watch. Every week on a Monday, the watch serves up a reminder showing you how you did, movement wise, the week before, with a goal for the coming week. 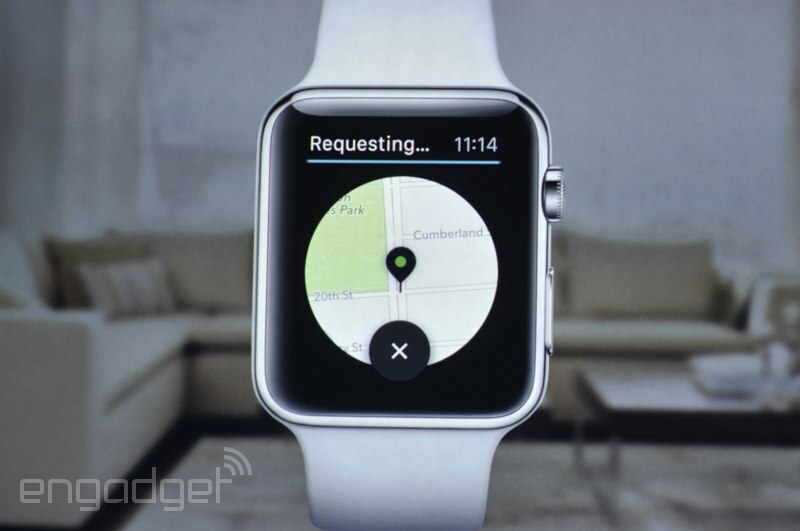 The watch tracks your daily movement. Reminds you if you've been sitting too long. 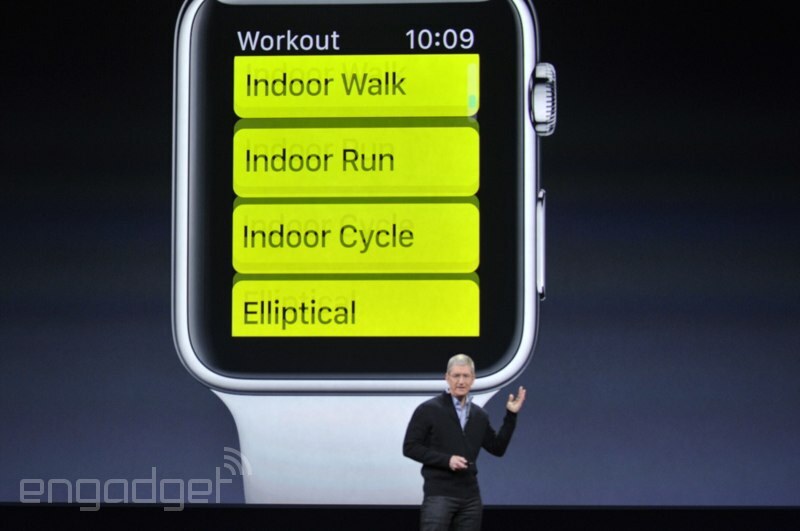 Like you'd expect a fitness tracker to. 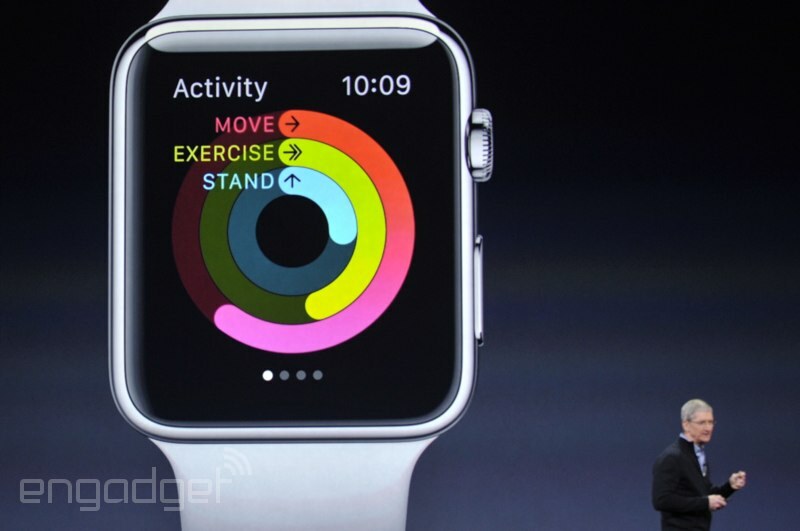 Tim is now touching on health and fitness features. 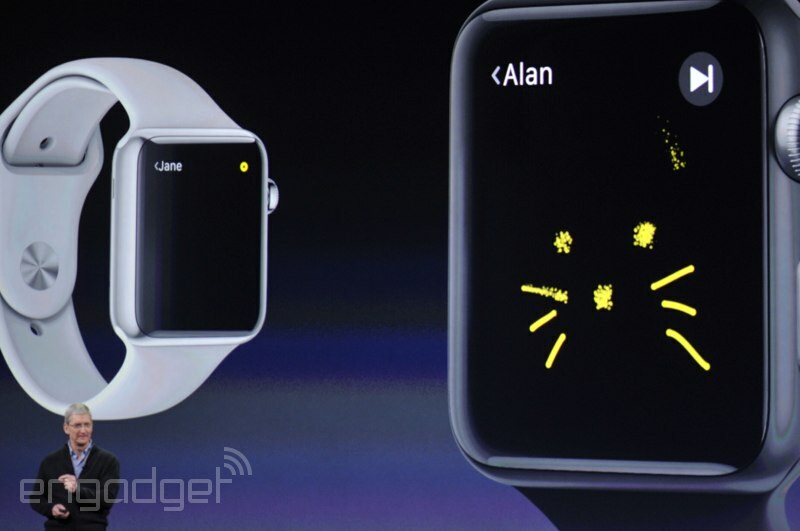 We're seeing demos of tapping your watch to get your friend's attention. 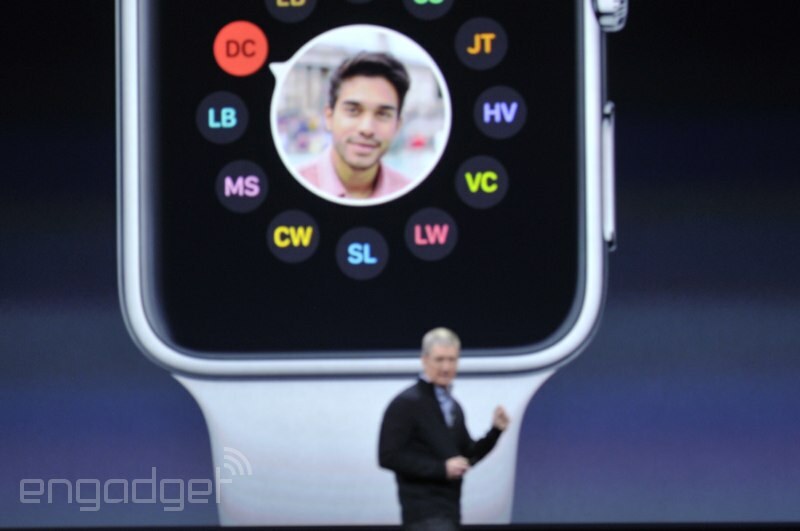 Sending your heartbeat, which is a feature I believe Apple has shown before. 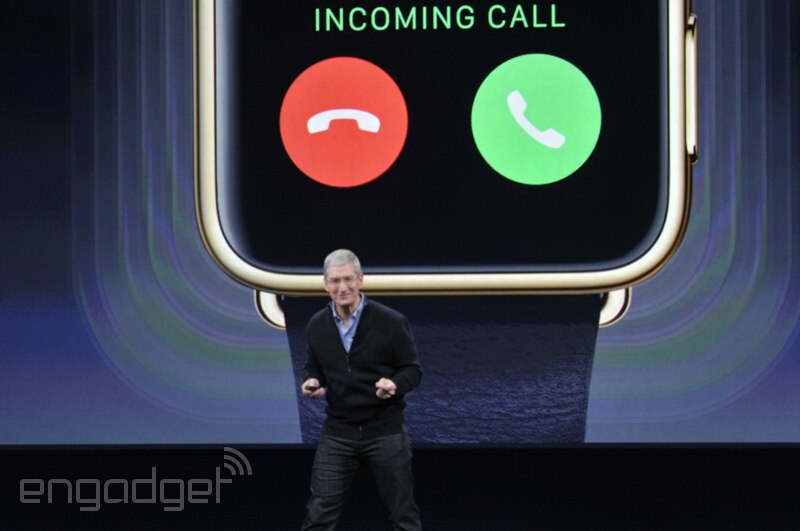 Tim Cook confirms you can answer calls on your watch, which he's been waiting for since he was 5. Me too, Tim. Me too. Chris VelazcoThough in fairness, LG's Watch Urbane LTE beat it to the punch... in Korea. 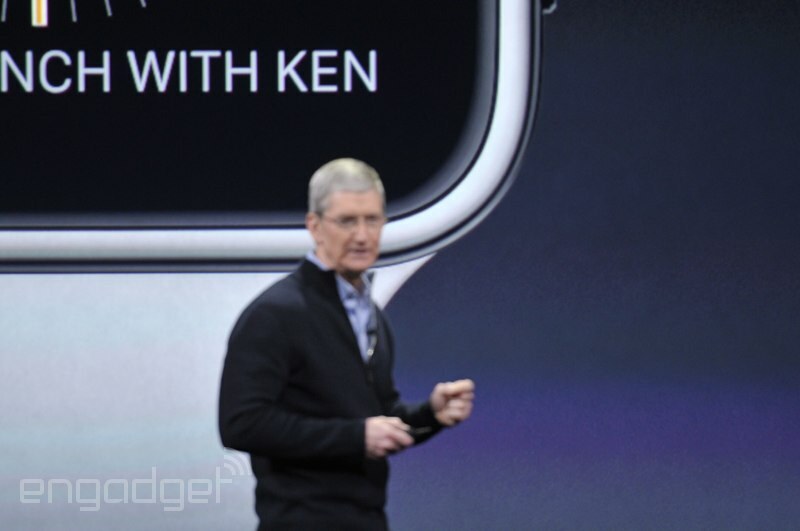 "Apple Watch allows you to communicate much more immediately and intimately than ever before," says Cook. 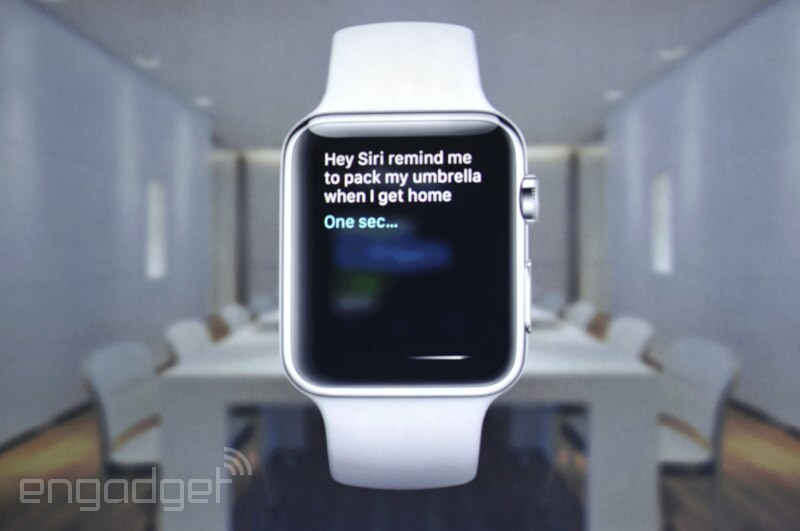 Apple Watch brings a whole new personal dimension to timekeeping. 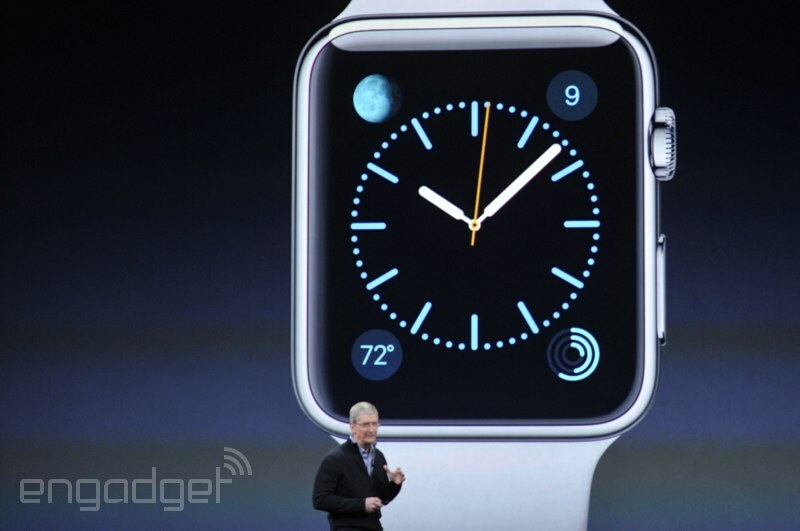 You can add the date or the world clock, the stopwatch or schedule details right on the face. 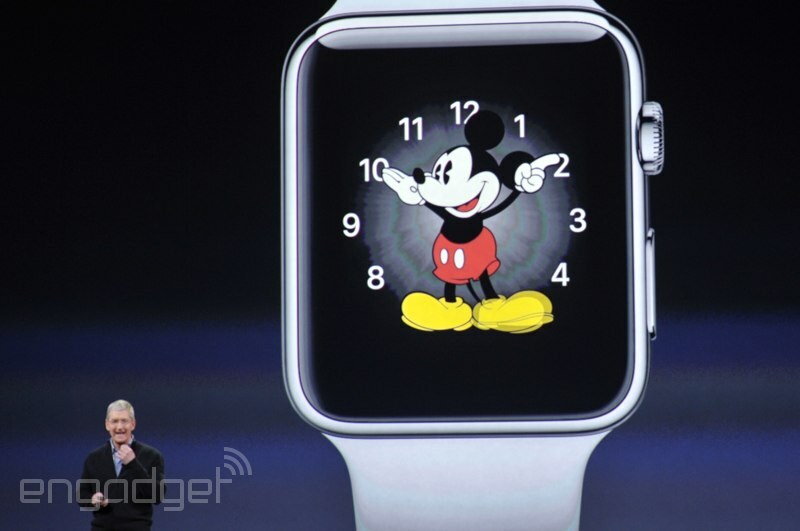 Want a watch face that features a blooming flower or an animated Mickey Mouse? Sure, they can do that for you. 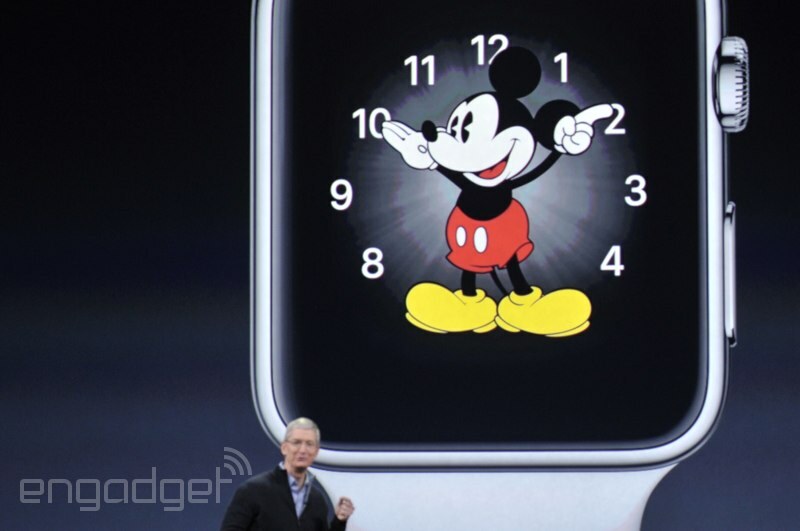 Want a watchface that features a blooming flower or an animated Mickey Mouse? Sure, they can do that for you. Recapping the difference watchface/band combinations. We're talking materials for a moment -- stainless steel, anodized aluminum and 18k gold. You know, for the ballers among you. 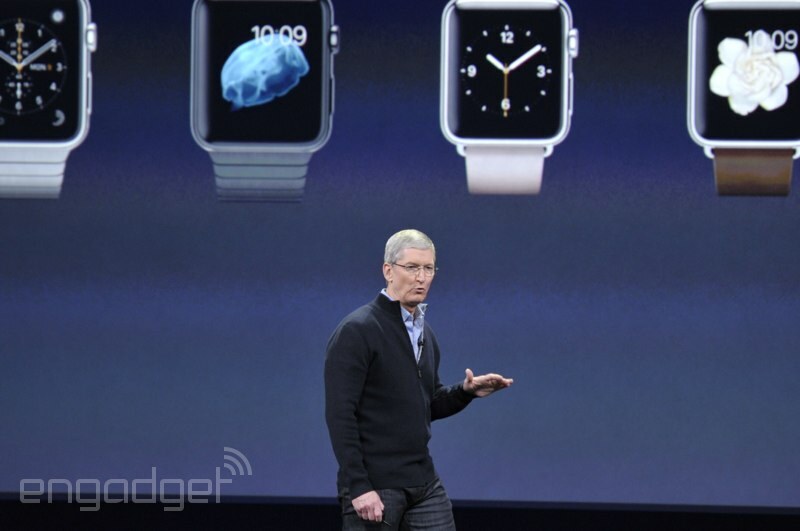 "It's the most personal device we have ever created." 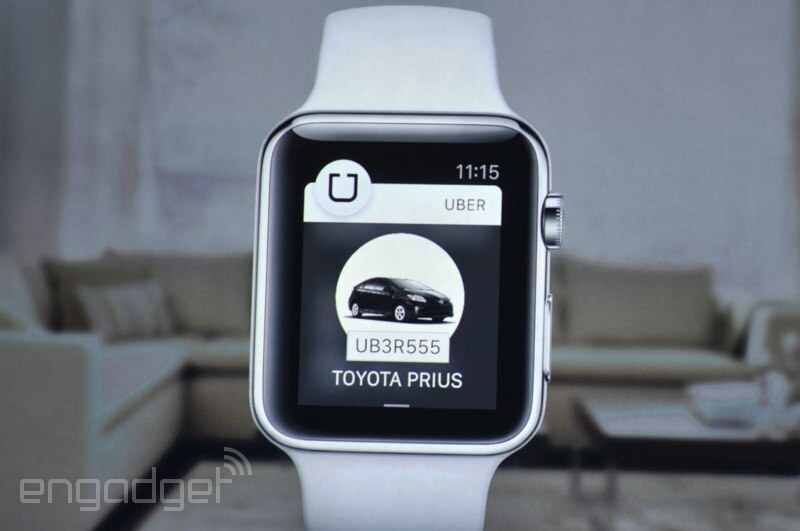 And now... the Apple Watch. 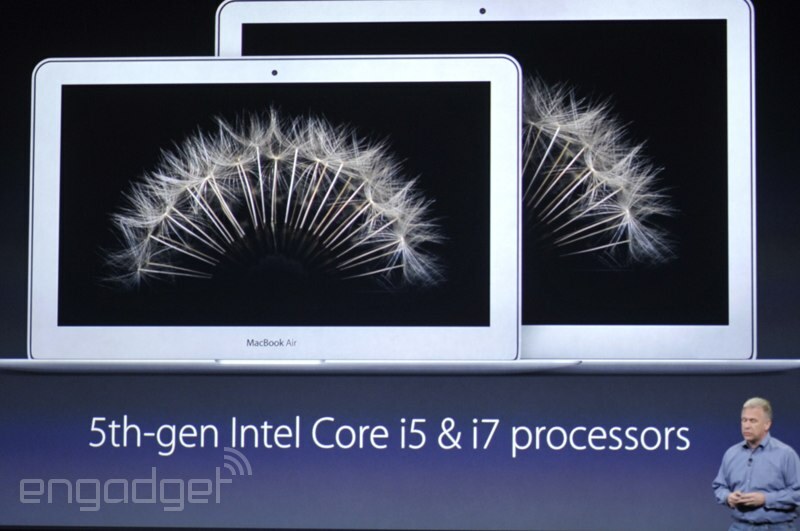 Meanwhile, the other Macs are getting a basic spec upgrade, and are available with new processors today. 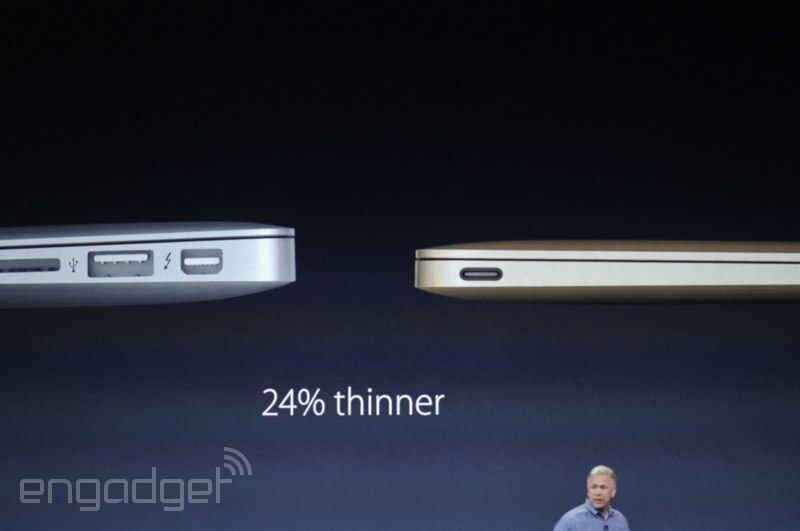 Thunderbolt 2 as well. 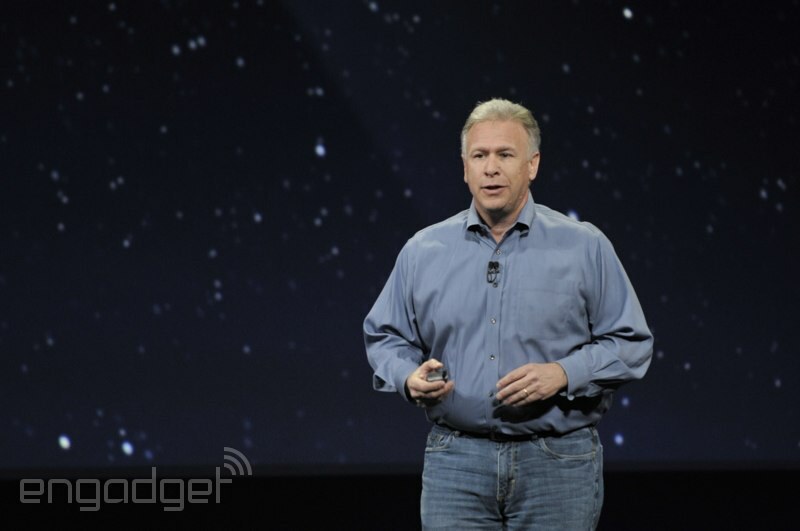 Dana WollmanThat means Intel's fifth-gen Core processors, in case that wasn't clear. In some cases, up to 10 hours of battery life, where it wasn't possible before. 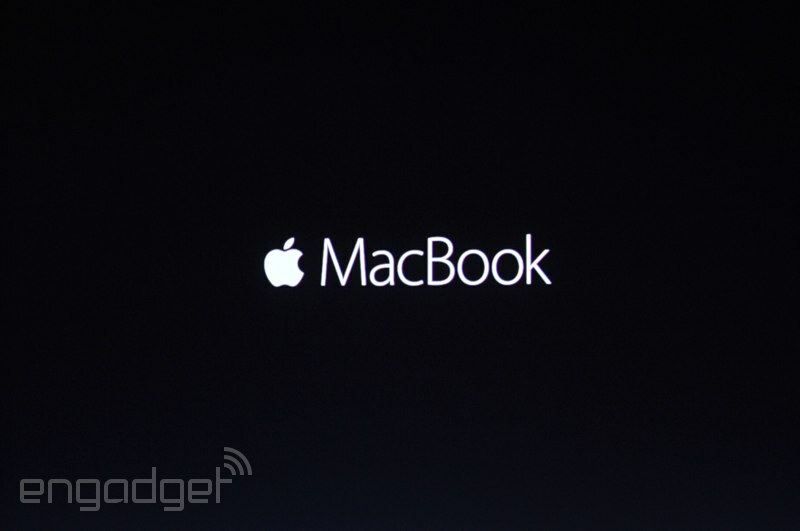 It joins the MacBook Air and MacBook Pro. 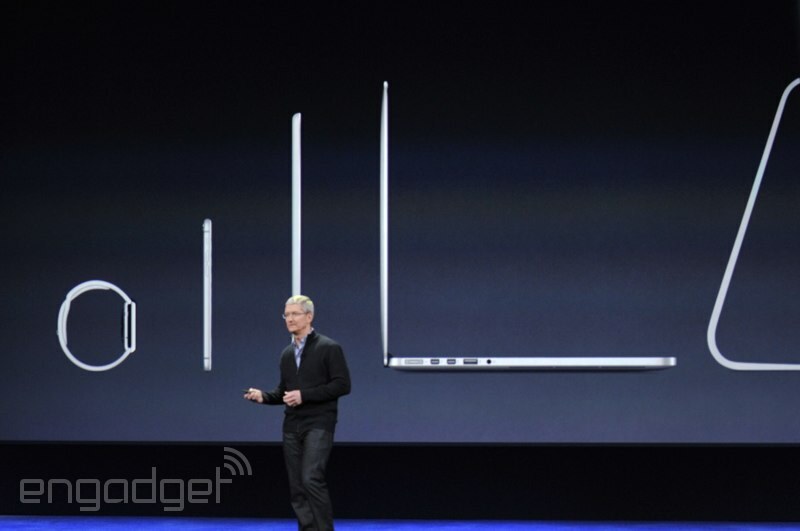 That explains why they were careful to call it "the new MacBook." 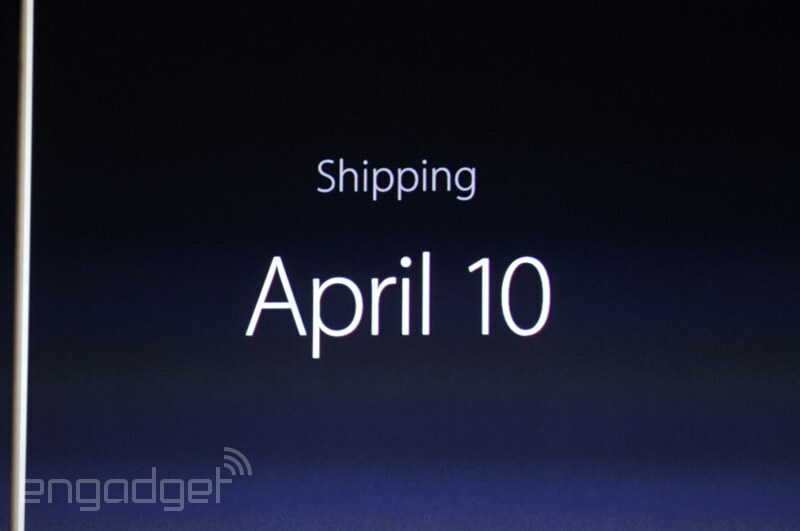 It will ship on April 10th. $1,299 is the price. 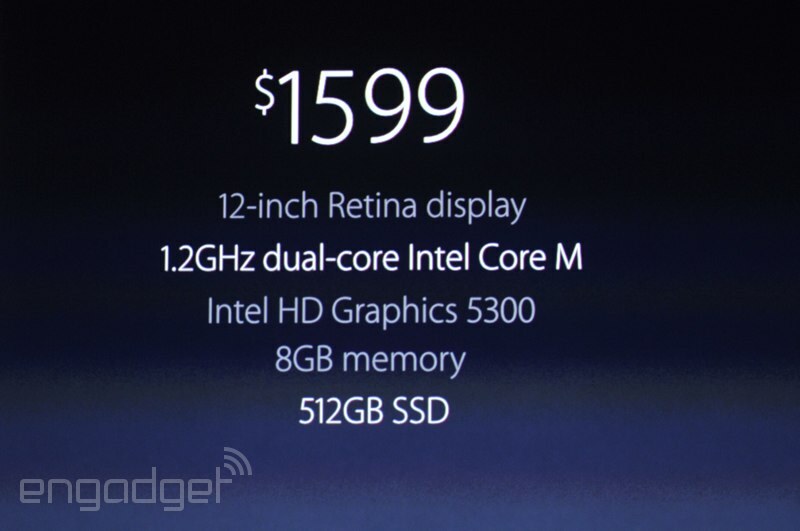 That gets you Core M, 8GB of RAM and a 512GB SSD. 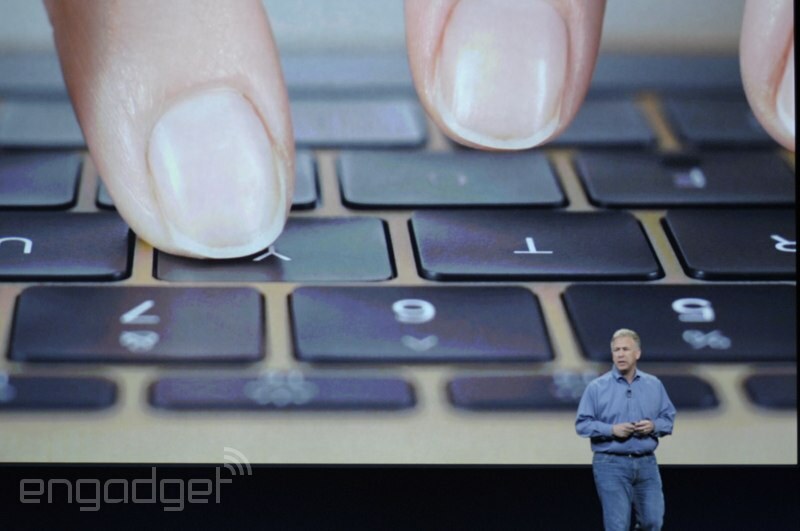 So this whole thing begs an interesting question -- how small do we actually *want* our laptops to be? 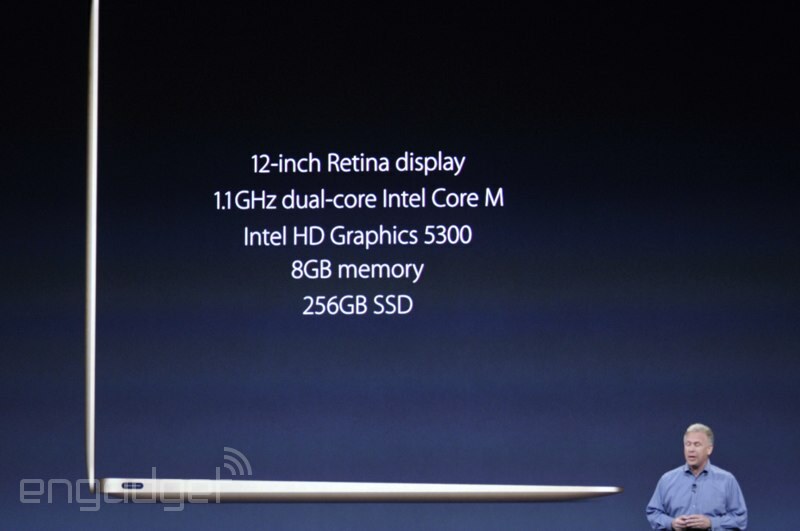 Chris VelazcoAnd for that matter, where's my 13-inch Retina Air? 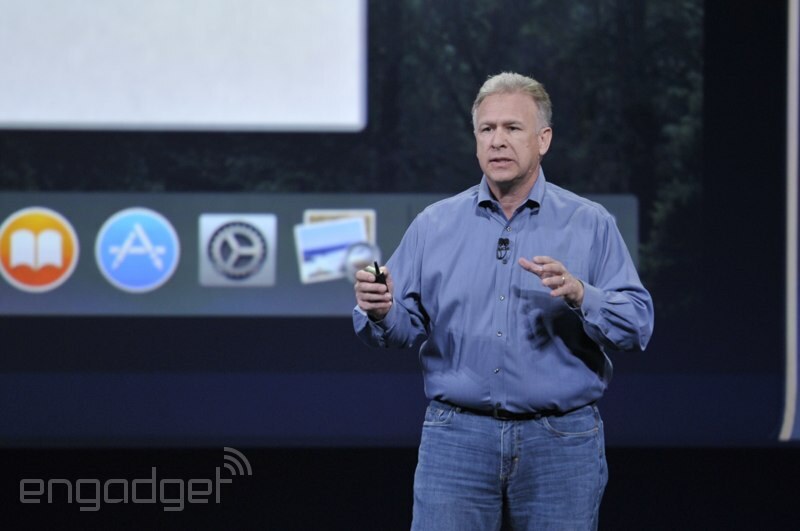 Seriously, Jony Ive (assuming that's him), has a voice to rival Jeremy Irons and Alan Rickman. Someone get this guy to voice a Disney villain. And now, we're seeing a video. Starring Jony Ive, it seems. 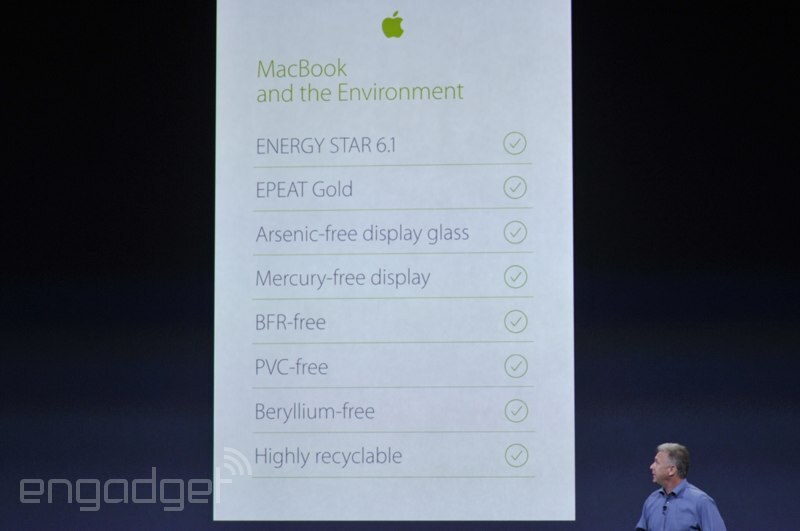 Good thing it's recyclable, because you'll probably never be able to upgrade anything in it. But first, a note on eco-friendliness. It meets EPEAT 6.0 standards. 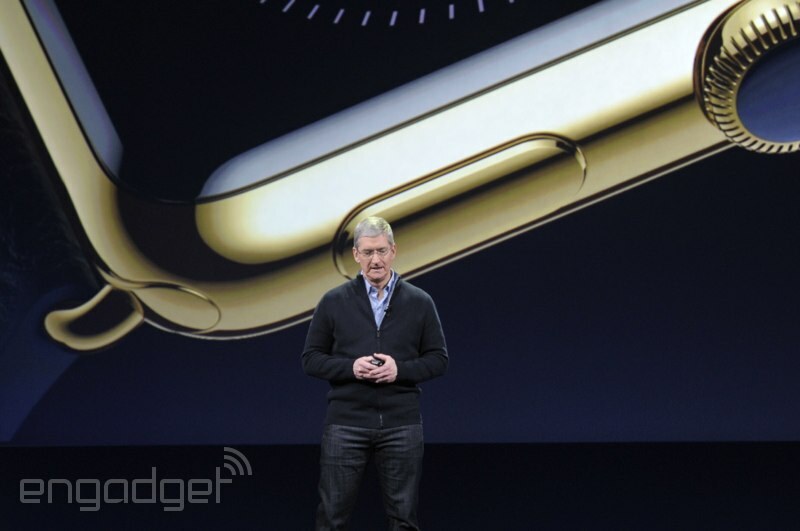 It comes in silver, space gray and "stunning" gold. But price...? Availability? 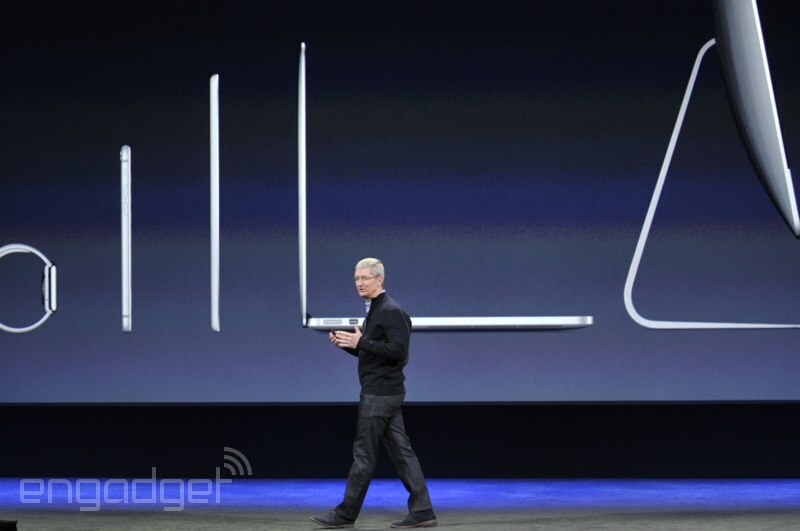 Phil seems to be summing up: talking again about the display, battery life, keyboard, trackpad, redesigned interior. The age of USB-C is upon us. 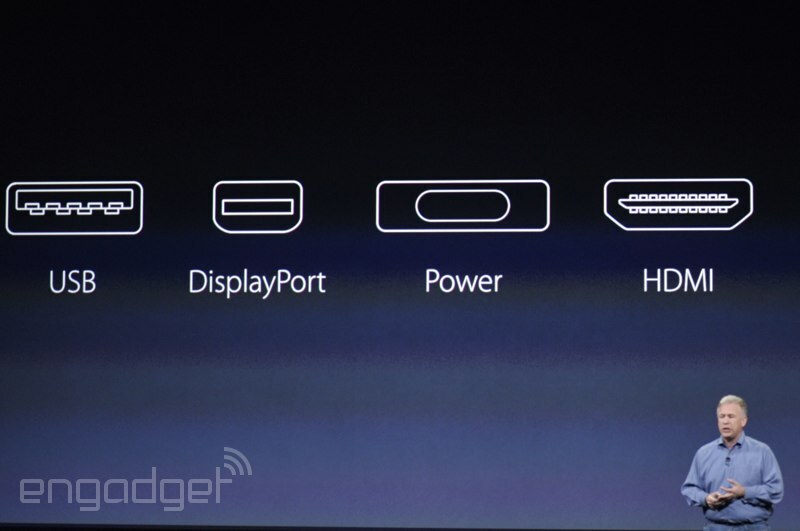 Ports: one connector support USB, DisplayPort, HDMI and VGA. 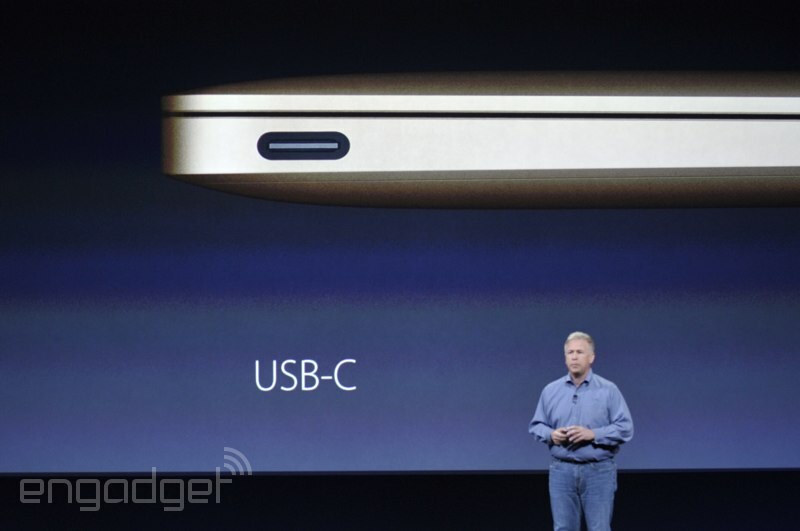 It's USB-C, which we've heard about before. Dana WollmanExpect to see this on more laptops this year, by the way. 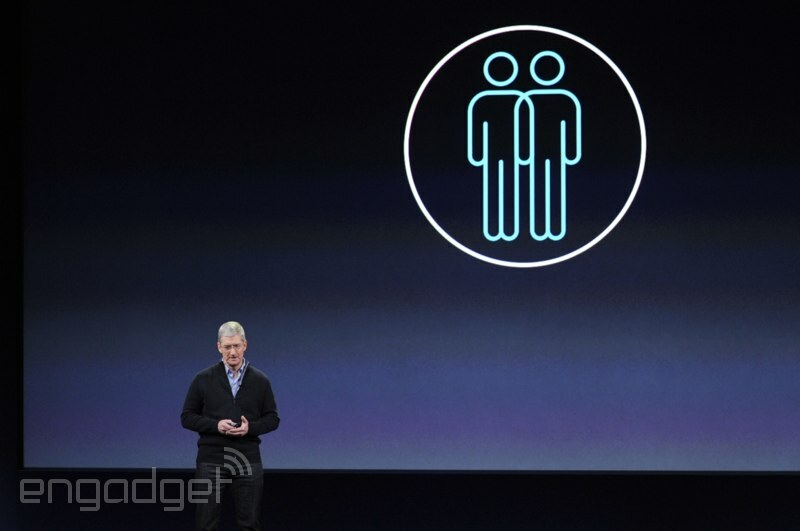 Apple won't be alone here, I assure you. And there's the first Beats shout-out of the day. 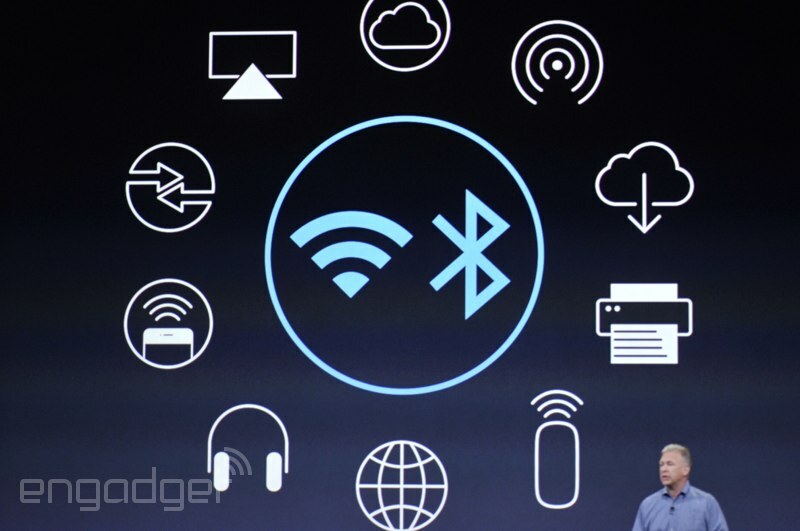 Other upgrades: 802.11ac WiFi and Bluetooth 4.0. As you'd expect on a new flagship laptop. 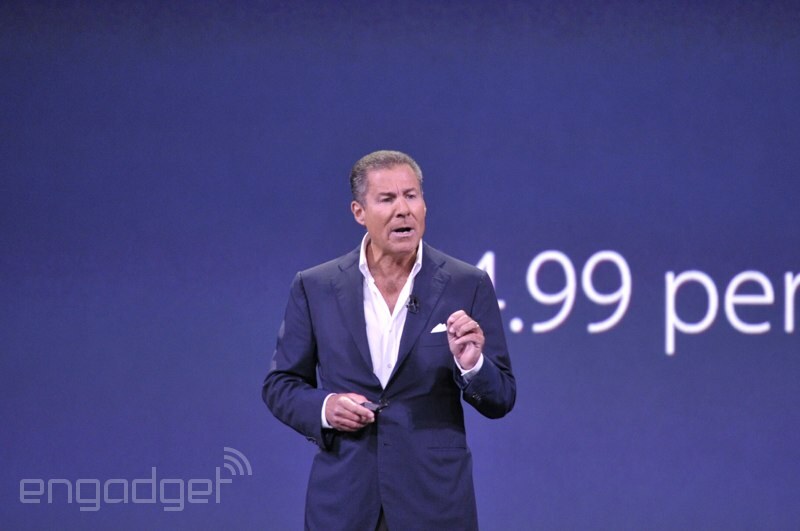 That translates to nine hours of web browsing and 10 hours of movie playback. 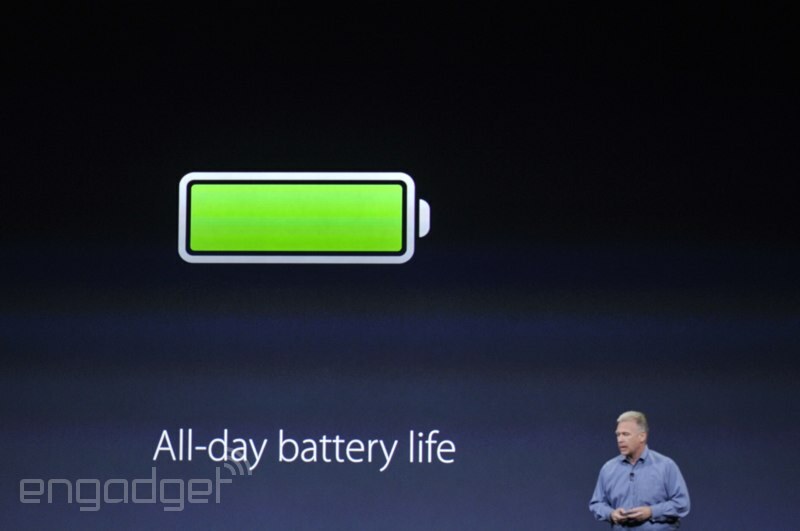 Now we're talking about the battery life. 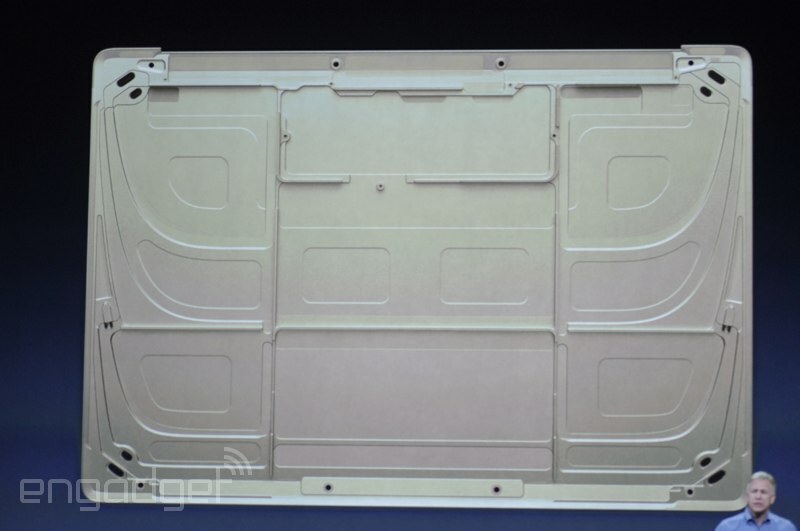 It's a "terraced," contoured battery that fit the contours of the MacBook's enclosure. Just stuffs the whole thing, in a way that a boxy rectangular battery wouldn't. This, for lack of a better word, is dope. 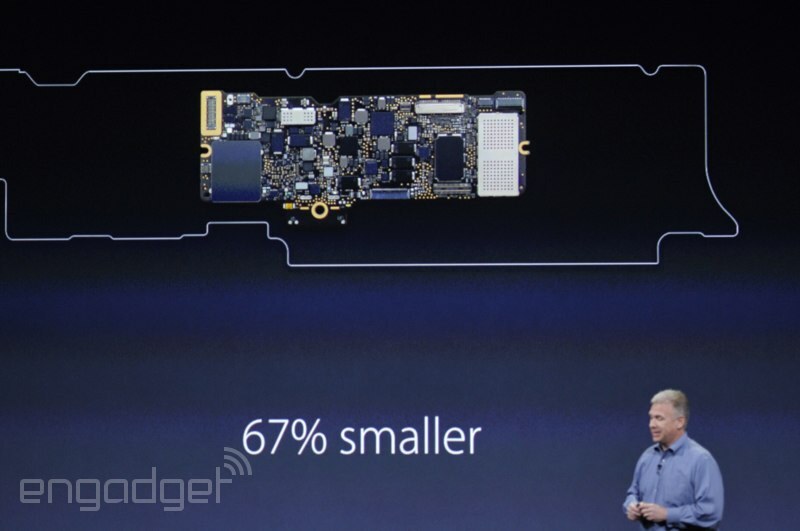 The logic board is 67 percent smaller than on the previous-gen model. 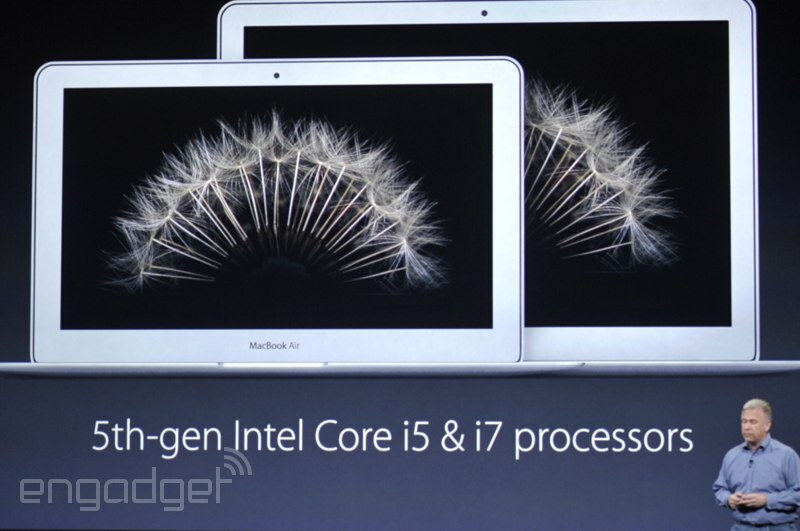 Intel's Core M processor is on the inside, which helps explain why the laptop is so thin. 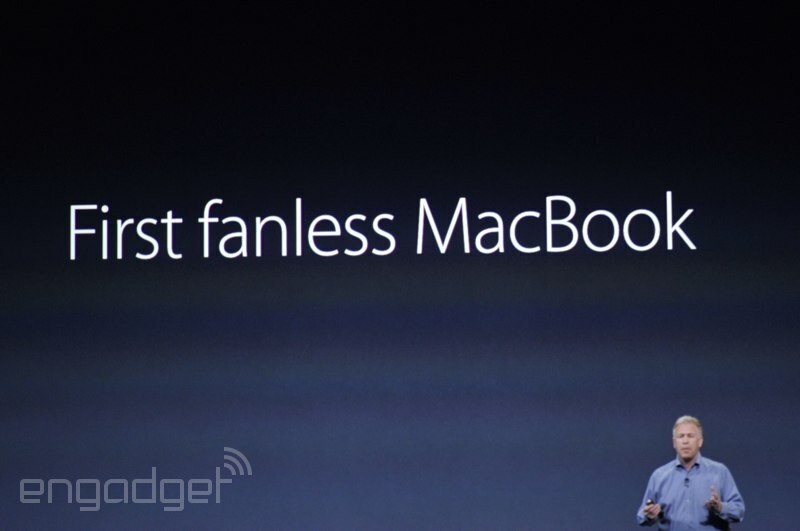 The new Macbook is the first fanless model ever. Dana WollmanAs rumored, by the way. And under the hood? 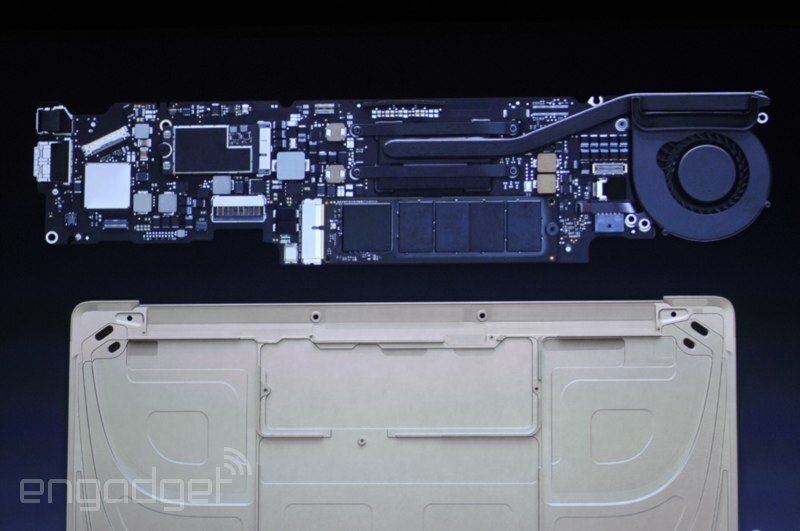 We've got the "latest unibody architecture," says Phil, with components mounted directly to it. Ooh, and it works in video playback too. Force-click to fast forward. We're looking at a whole new kind of gesture here, too. The Force Click is kinda-sorta analogous to the three-finger tap when it comes to word definitions, but there's way more to it than that. 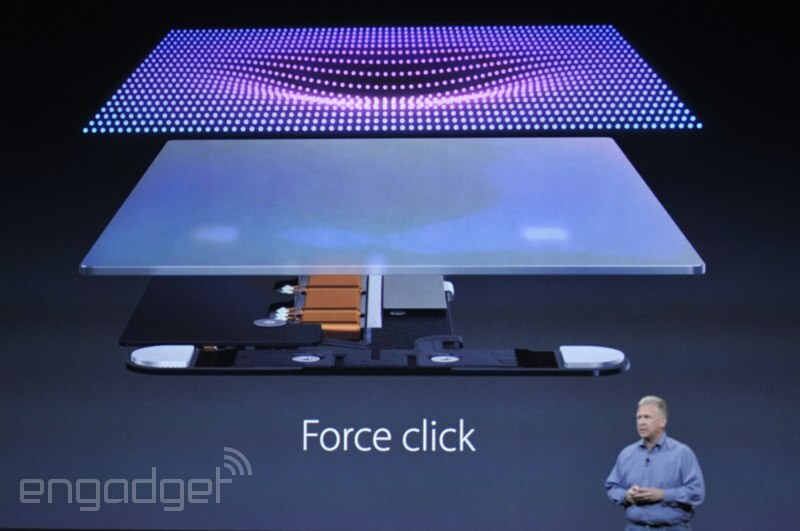 The trackpad comes with a new gesture called a "force click." In OS X, that allows you to press hard on an address in the Mail app to get a location. This works with Wikipedia in Safari too. You can use force clicks on files in Finder to see a preview of whatever's in there. 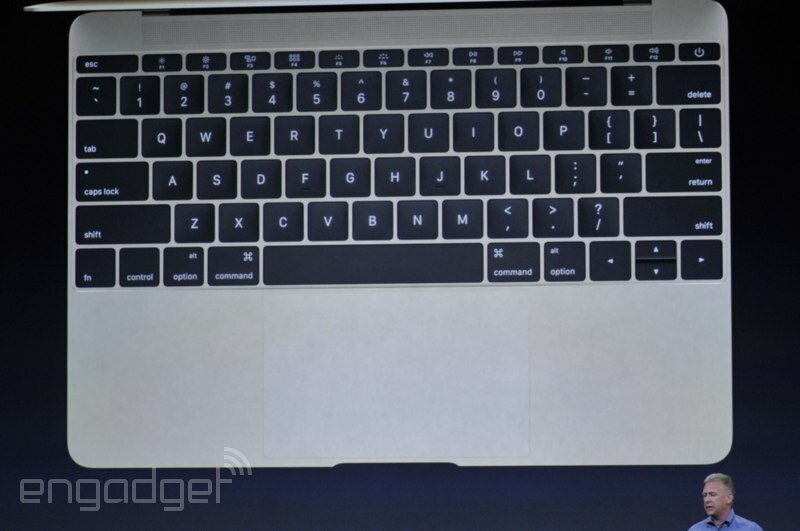 New trackpad too. Not a "diving board," Phil says, with one end that depresses. It's pressure-sensitive. 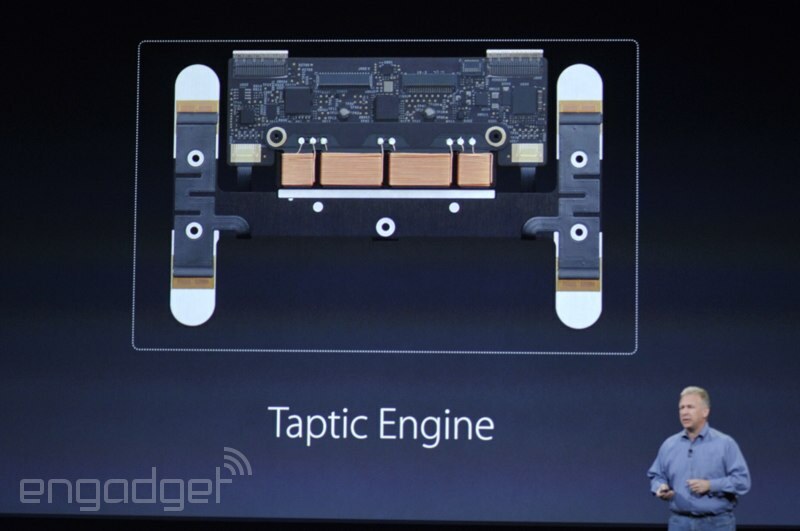 Dana WollmanI wonder if it's based on Synaptics' ForecePad technology. So this is honestly a gorgeous machine, but as an owner of a first-run Retina Macbook Pro, maybe some caution is in order. First-gen products and all, you know? 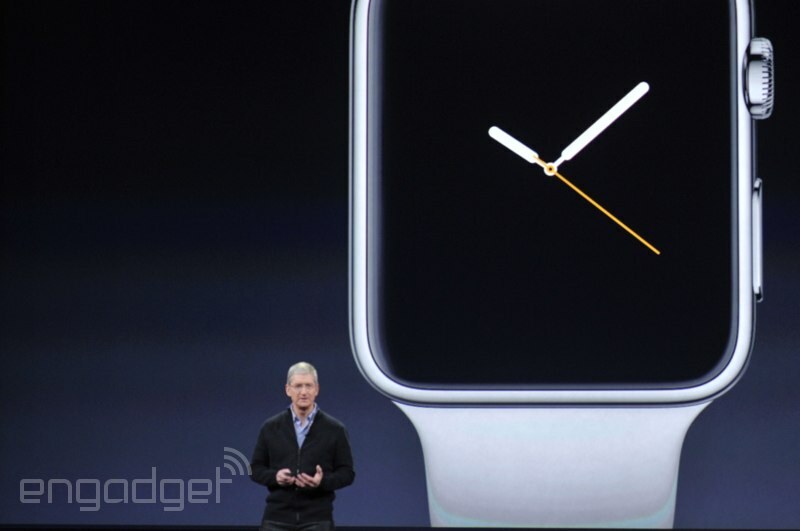 Phil says the display consumes 30 percent less energy. 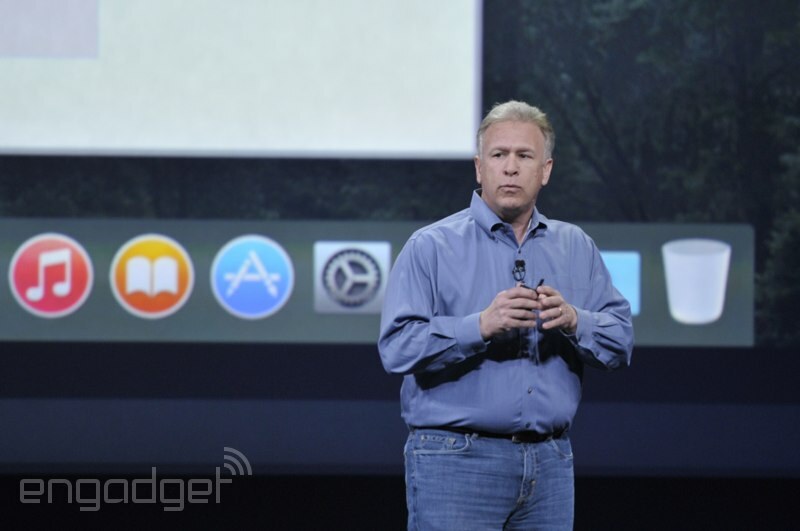 Dana WollmanI'm assuming that means 30 percent less than the current Retina display. 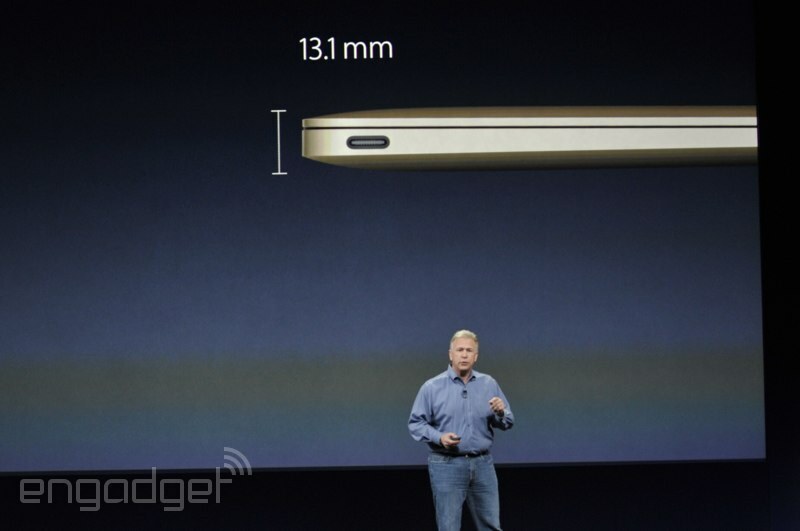 The panel measures 0.88mm thin, the thinnest display ever to be used in a Mac. The display is now 12 inches. And it's Retina! (Fricking finally.) 2,304 x 1,440 pixels. Oh, and that's a new font (Helvetica?) on the keyboard. Phil is taking about how they're still accurate, even if you hit them toward the side. There's also an individual backlight for each key cap (we've seen other PC makers do this, HP being one of them). 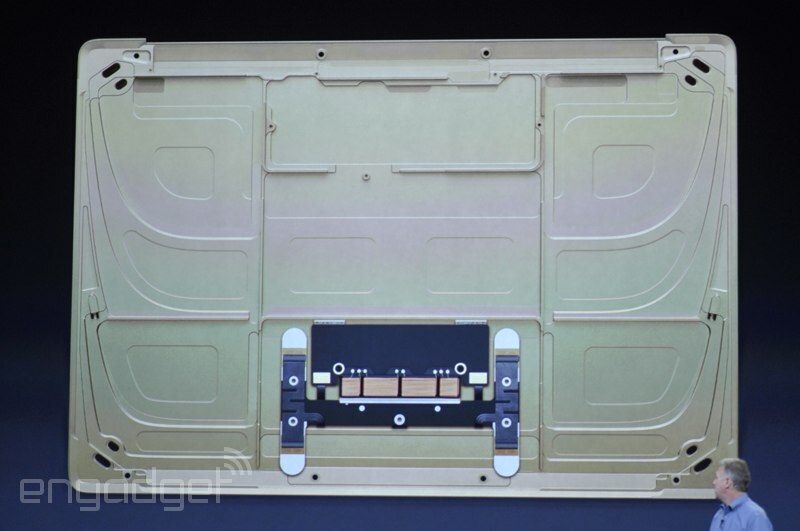 Lots of robust materials, like steel and glass, baked into those butterfly mechanism keys. 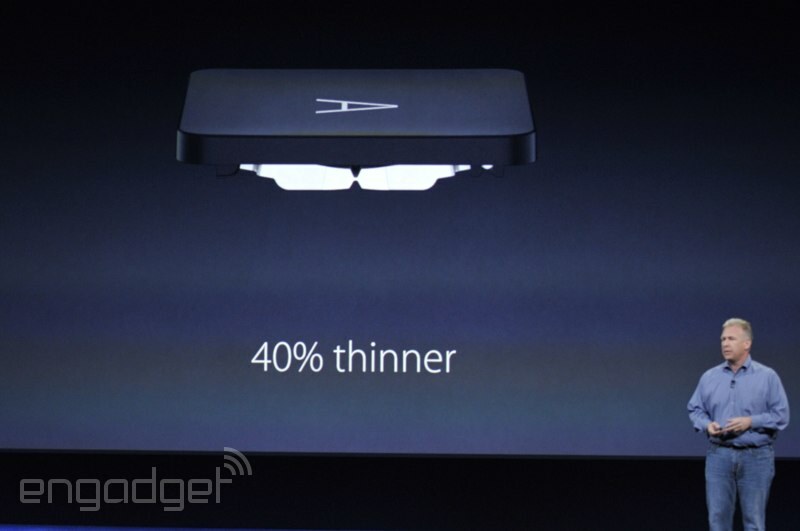 The keyboard itself is 40 percent thinner. 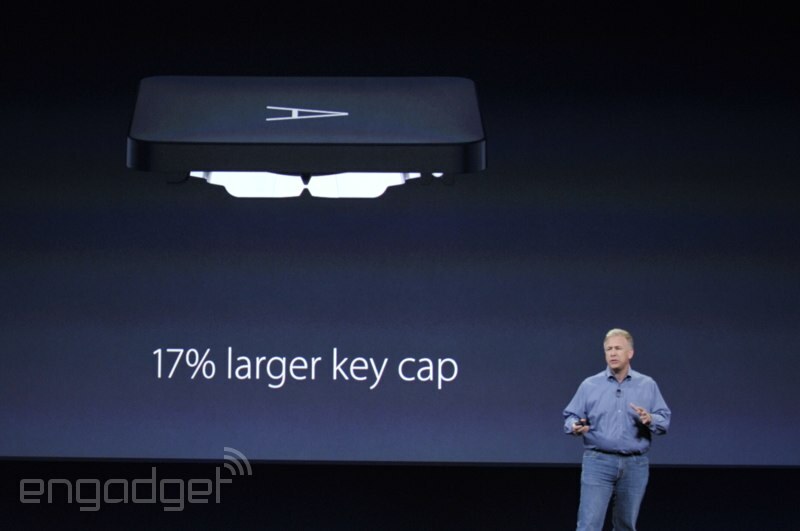 But the key cap is 17 percent larger. That's no small gamble -- Apple's current keyboard is widely loved. This one needs to be at least as good. Keyboard goes from one end of the keyboard deck to another. 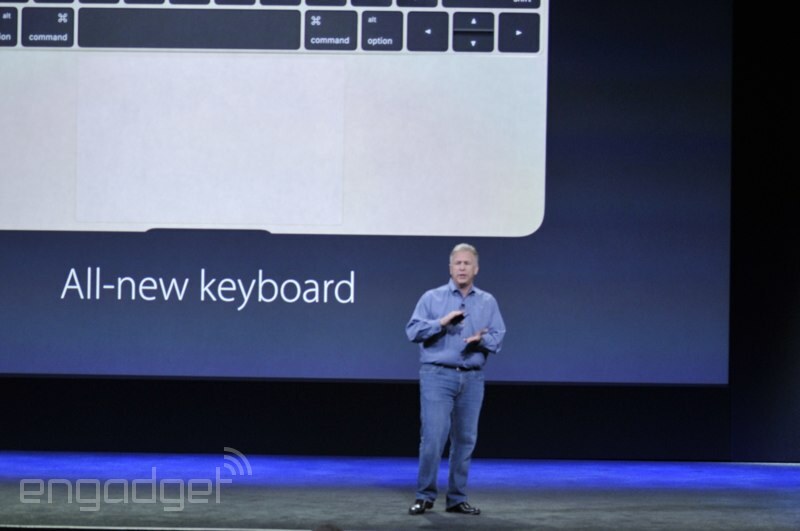 It's a brand-new keyboard too -- it had to be, given how much thinner the machine is. 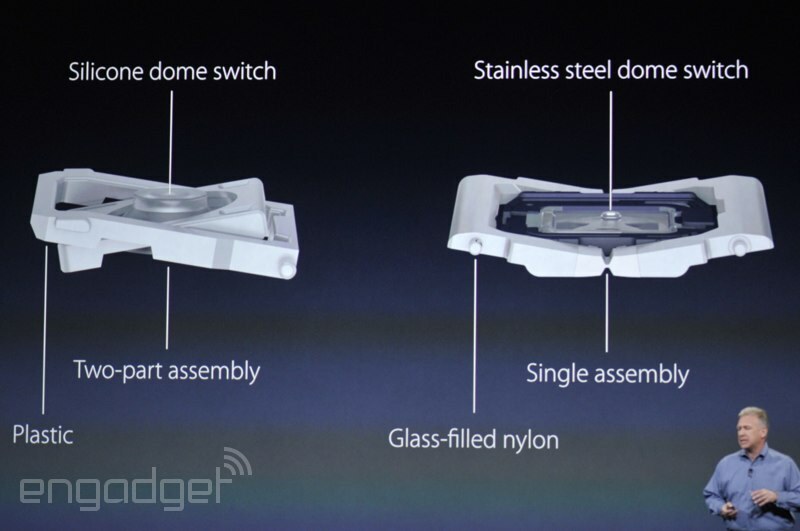 It's still an all-metal enclosure. 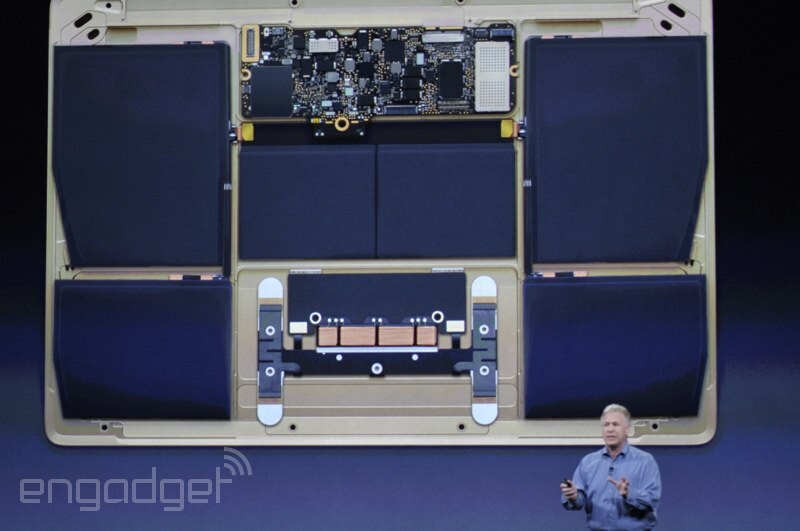 Antennas are integrated differently than before, Phil says. Oh yeah, that looks like a USB Type C connector. The leaks! They were right (probably)! 13.1mm thin and its thicket point. 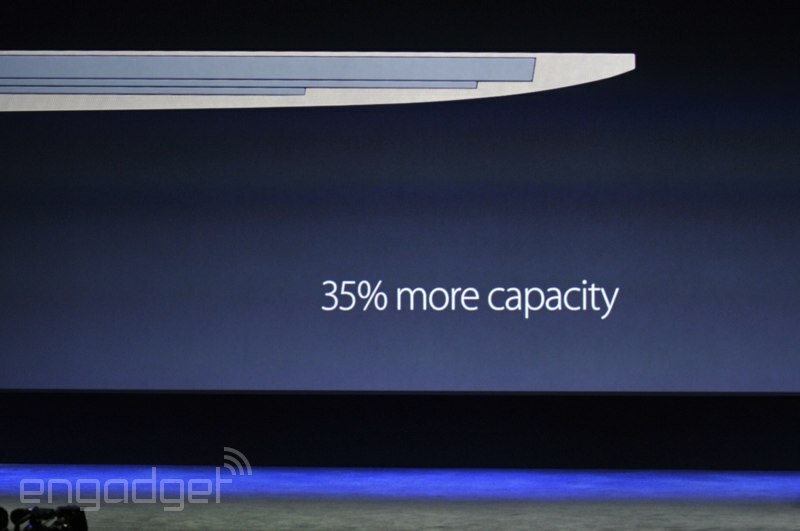 That's 24 percent thinner than the previous-gen 11-inch MacBook Air. 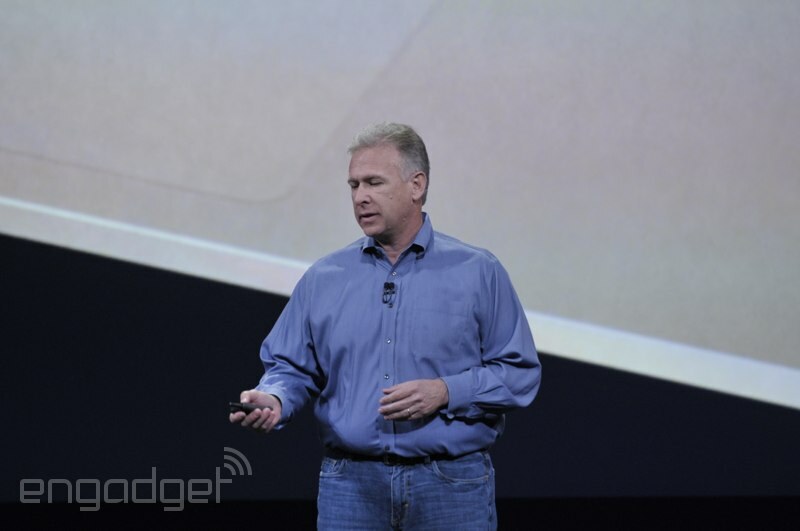 Dana WollmanThe lightest Mac ever. "The most extreme and efficient notebook we have ever created." 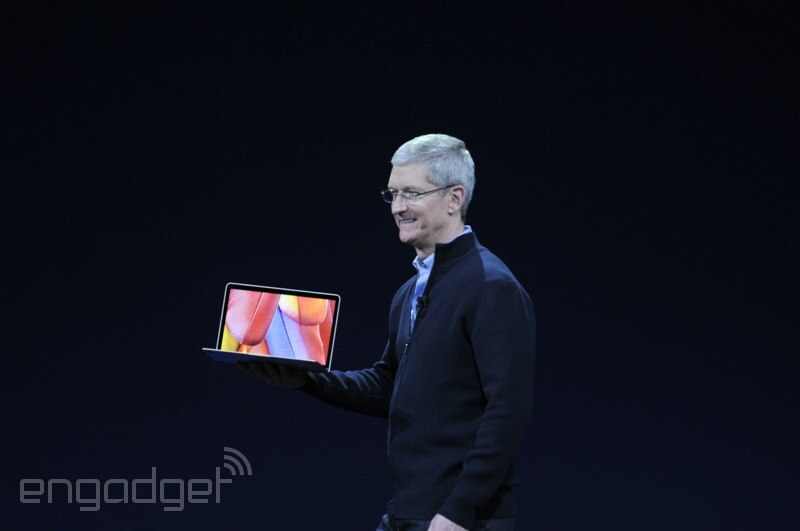 From our vantage point it looks *almost* iPad thin. 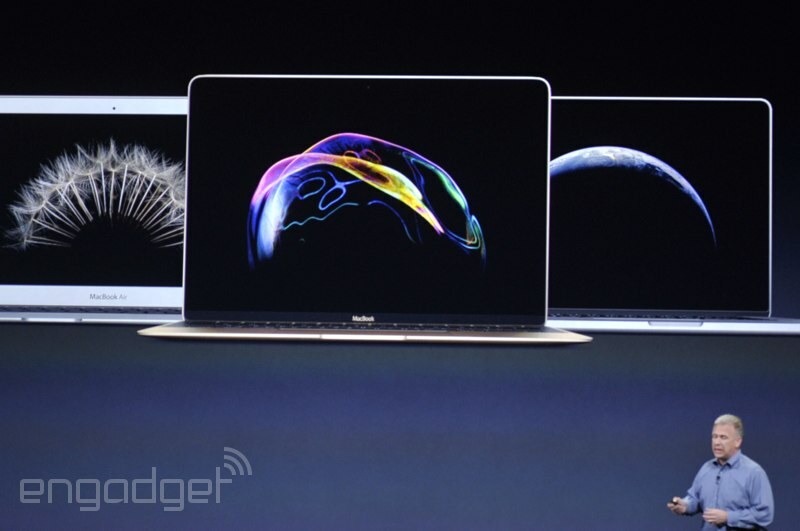 So this is the new MacBook. Unclear if the "Air" branding applies here. Ooh, that's quite a lot of gold. Dana WollmanBut silver too, for those who want it. 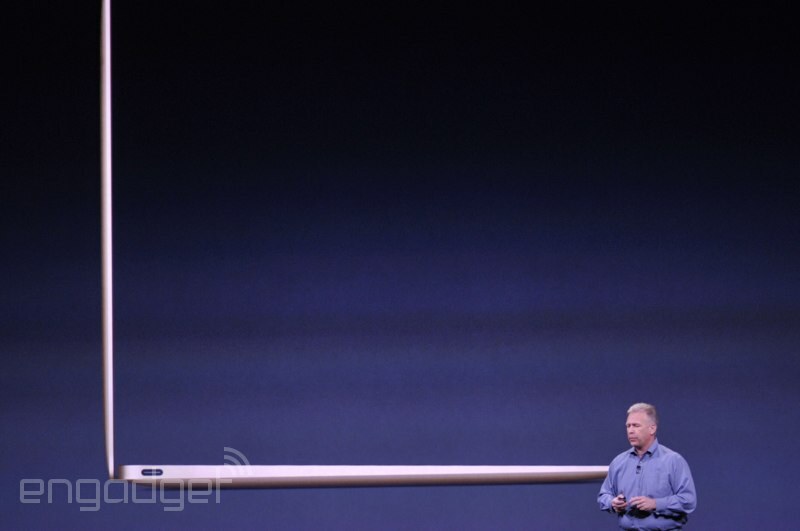 It looks super thin, as you'd expect. Teaser video going on now. Stay tuned for the big reveal. 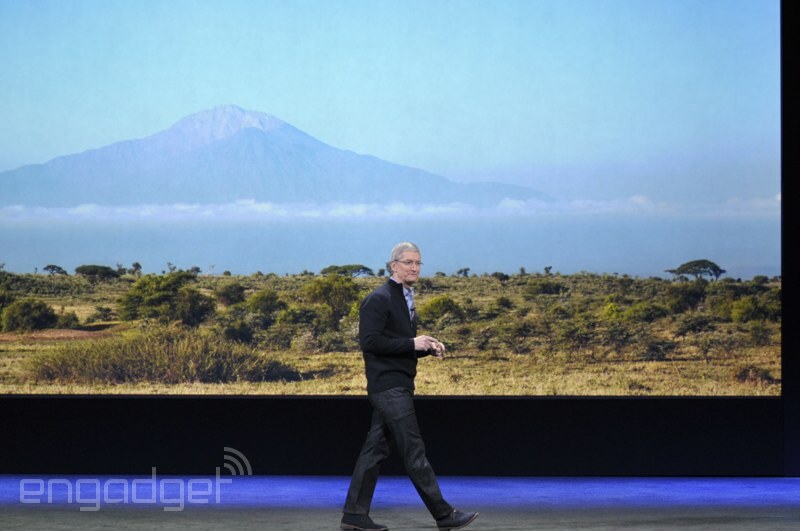 Tim Cook says something "ambitious" and "bold" is in store. 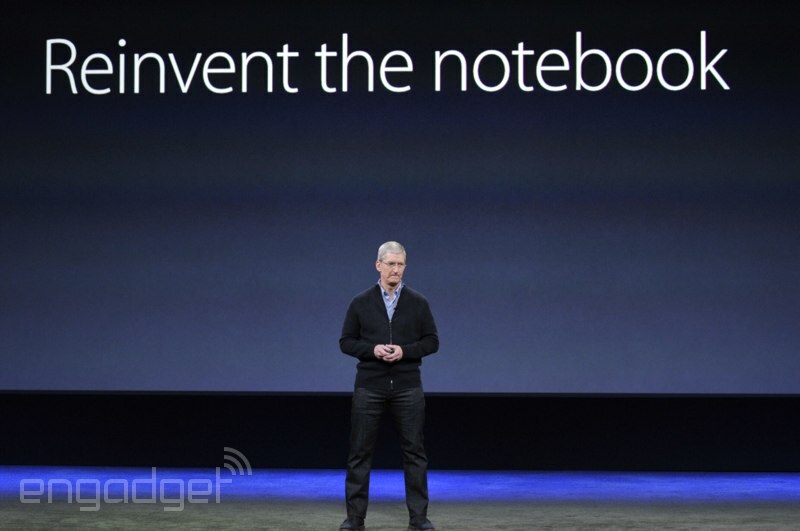 That Apple challenged itself to reinvent the notebook. 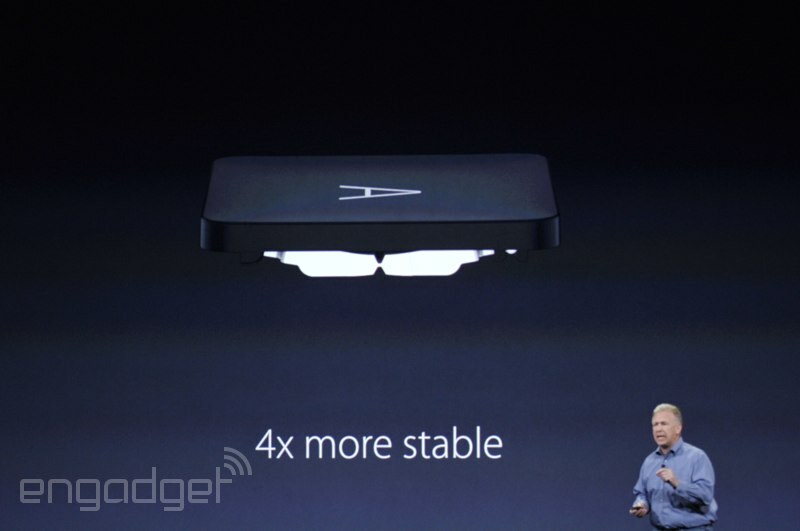 "The definition of portability has changed in the last several years led by iPhone and iPad." Nice little pump fake there with the Mac, Tim. You sure you didn't play football at Duke? 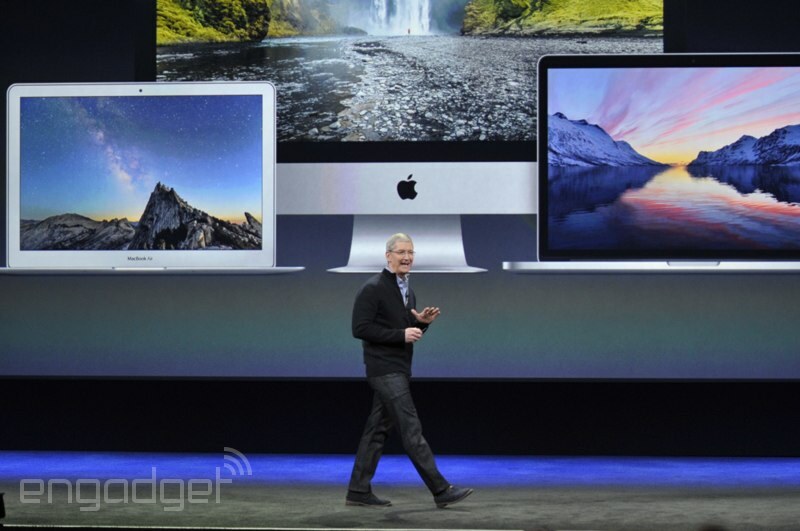 "This is the strongest Mac lineup we ever have had." 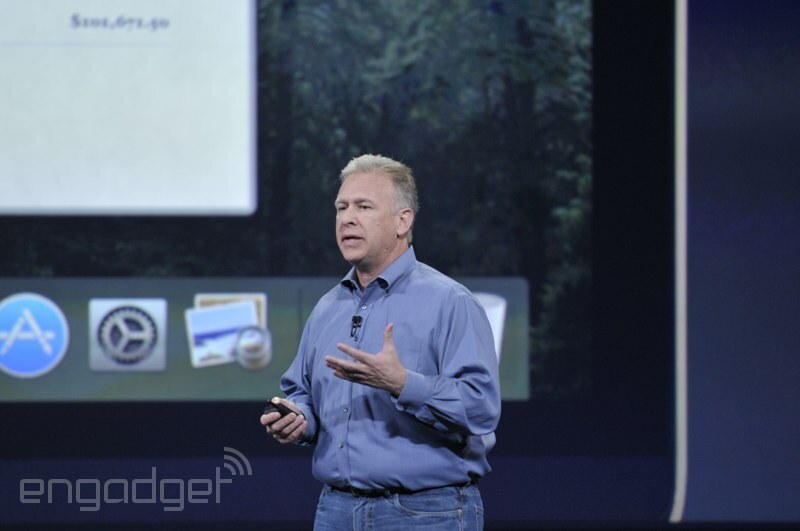 Dana WollmanCook adds that Mac has outgrown the industry every year for the past 10 years. 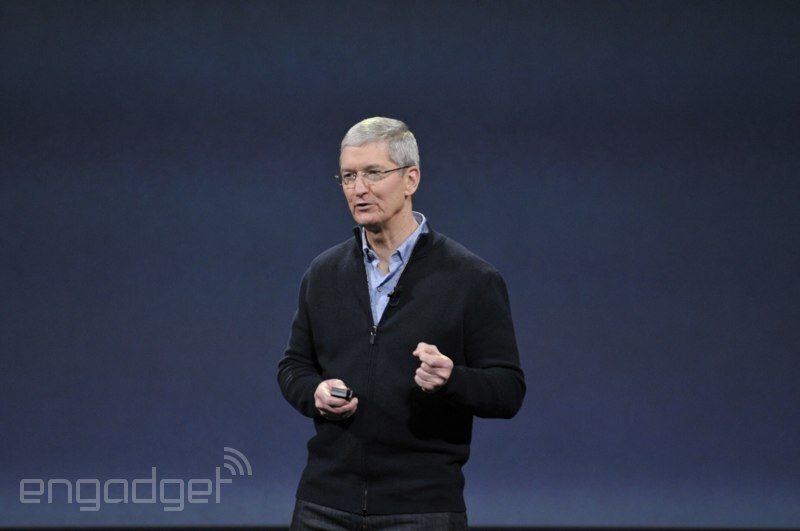 Tim Cook is back on stage now. "We can't wait to see what they [the developer community] do with it. Thank you." 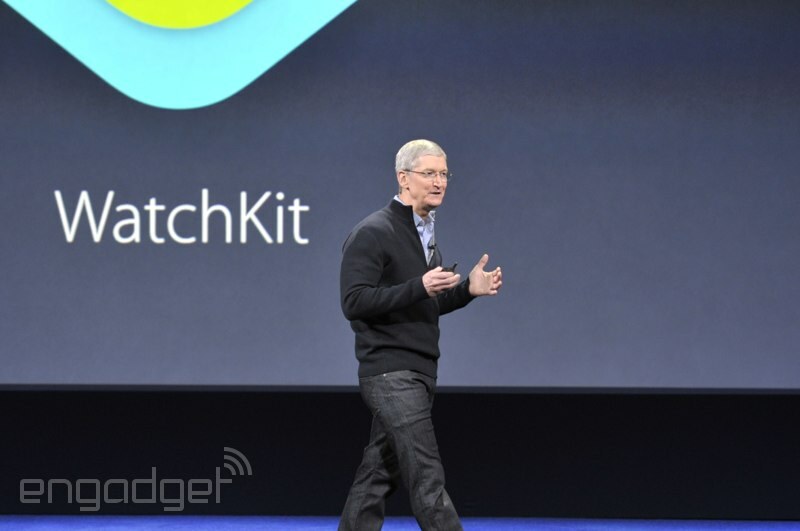 "We are releasing ResearchKit next month." 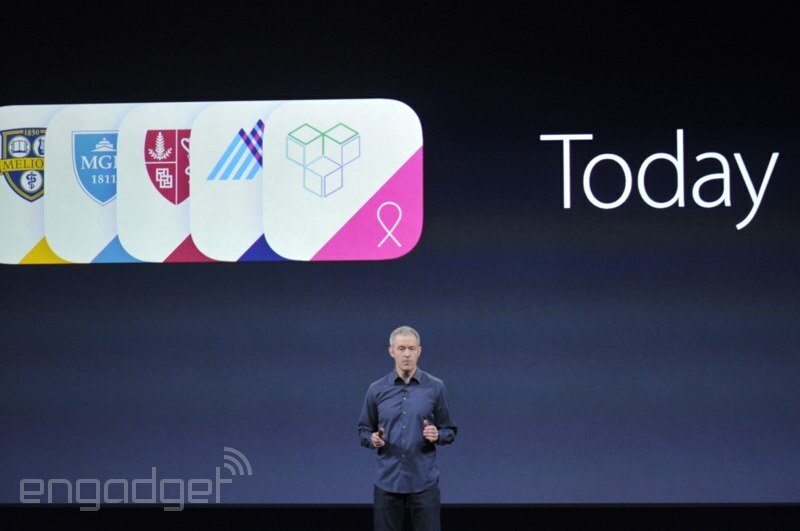 The first five apps are available today. To reiterate: OPEN SOURCE. YES. 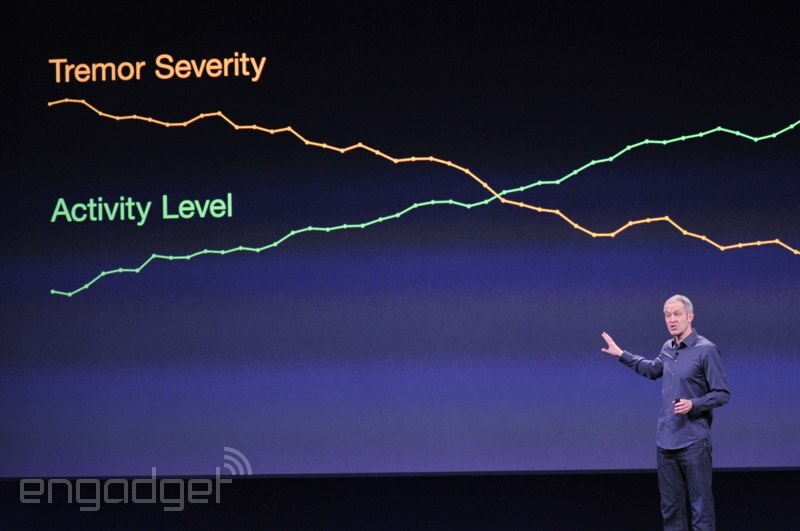 "We're gonna add to ResearchKit" over time, he says. 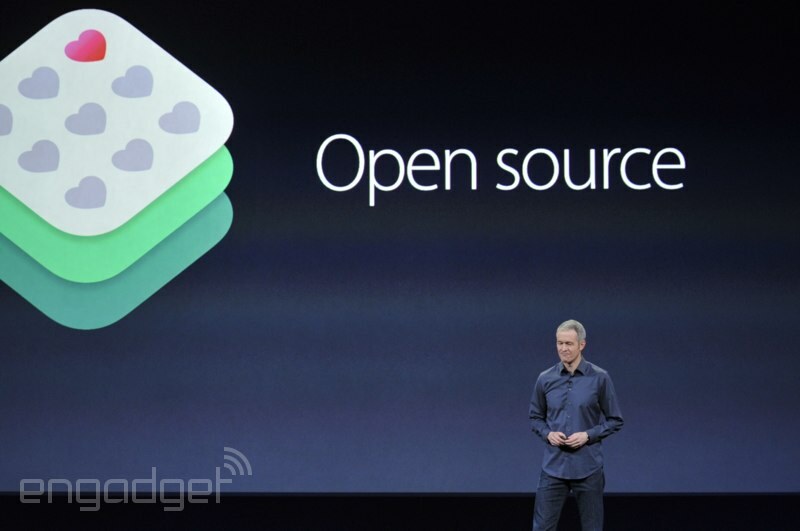 In the meantime, ResearchKit is open source. 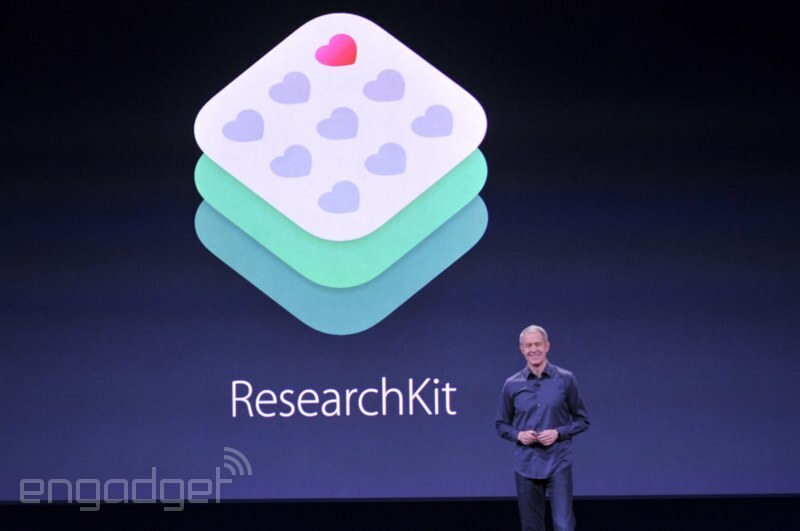 Really, forget the Watch, ResearchKit is the most important thing here today. 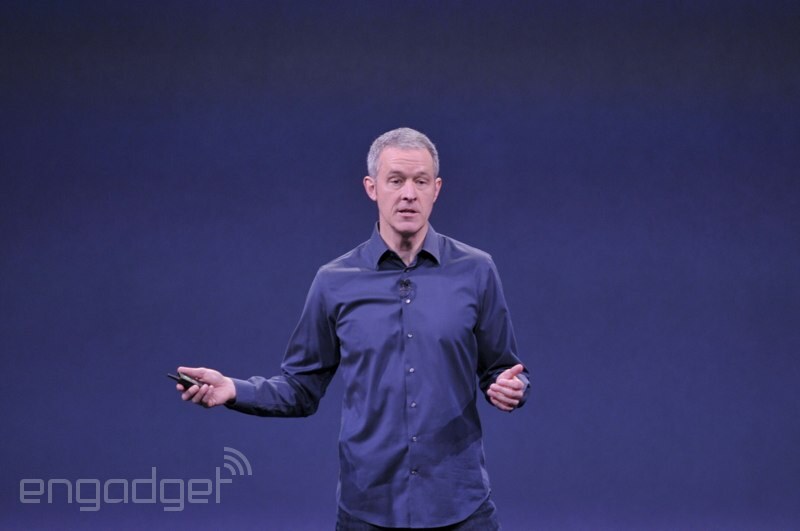 Jeff Williams is back on stage, greeted by extended applause. 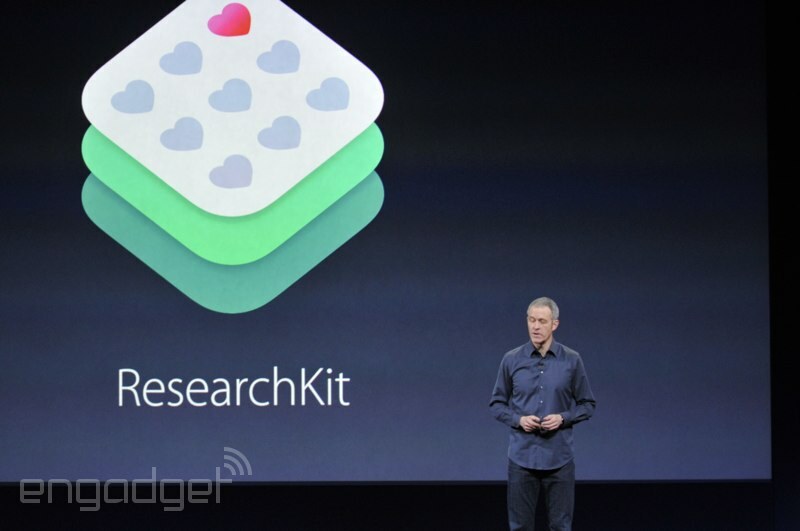 ResearchKit seems to be one of the more surprising -- and important -- announcements here today. What do you guys think? Tweet us at @danawollman, @numeson and @chrisvelazco. Wonder if there's going to be a way to incentivize these surveys and requests for health data built into ResearchKit. "Methods for medical research haven't really changed in decades," one researcher says. Another said that after sending out 60,000 letters in the mail, they might only get back 305 responses. Gets back to that small sample size issue. Right now, we're seeing a video that further highlights the use cases. Interviews with researchers, etc. 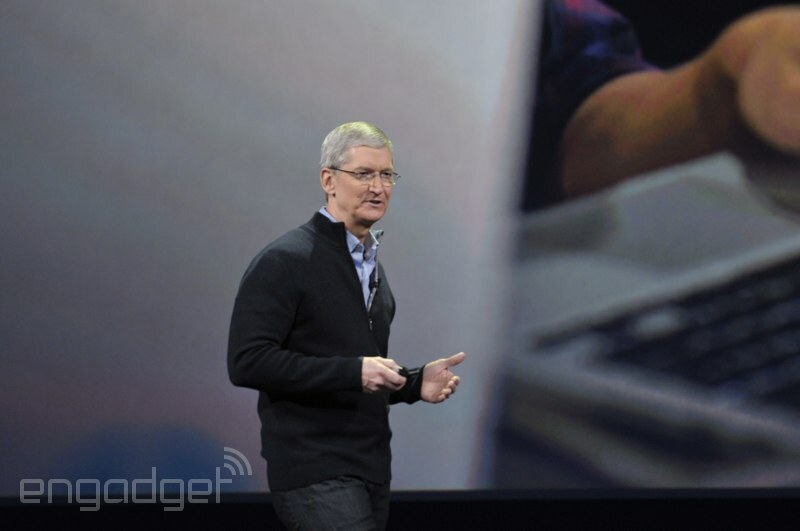 Apple will not see your data, he says. 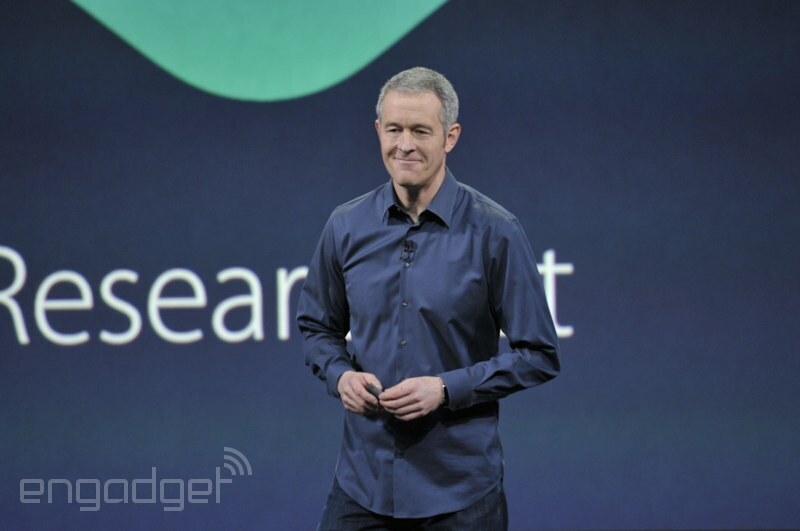 Apple's Jeff Williams is moving on to the issue of privacy. Researchers are swabbing surfaces around New York City in search of pathogens that'll exacerbate asthma. 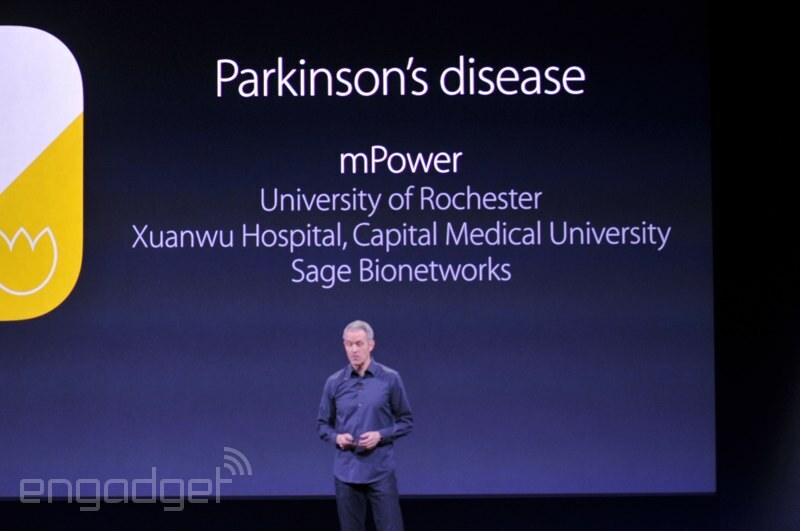 Other apps, besides Parkinson's: use cases for asthma, cardiovascular disease. Again, just a few examples here. Part of the story here is that the patients themselves can see data on their iPhones, not just the researchers. That gets at that one-way flow of communication thing. 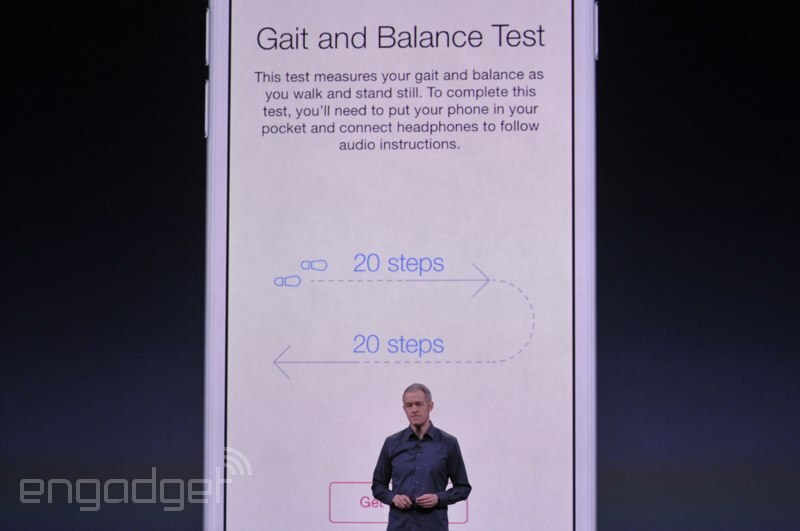 You can also take a gait and balance test. That's another use case. 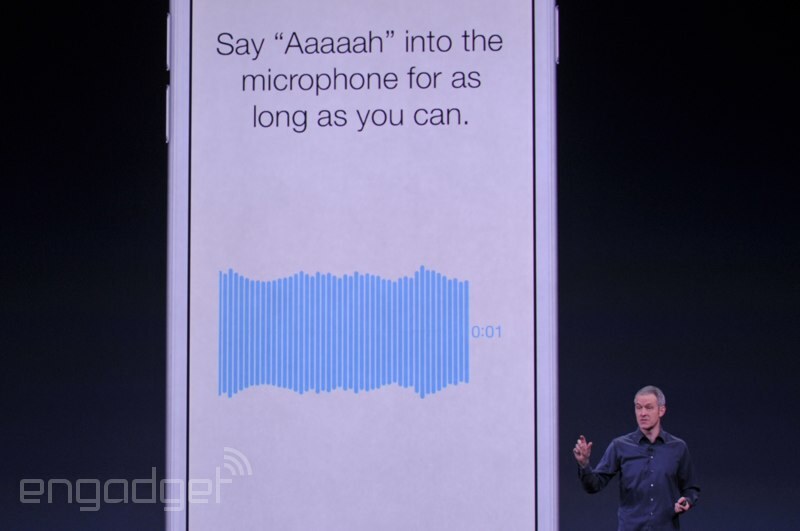 Here's an example: "You can say 'aaaah' into the microphone, and an algorithm can detect vocal cord irregularities that might indicate Parkinson's. Specifically, researchers can "easily" create apps -- I wonder if there's a developmental differential here. Big screen here full of researchers who partnered with Apple. University of Rochester is just one example. 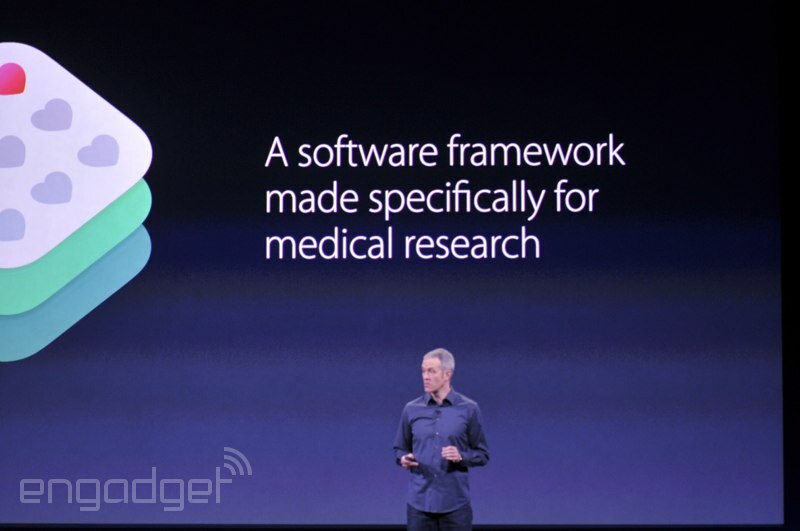 It's a software framework designed for medical researchers. 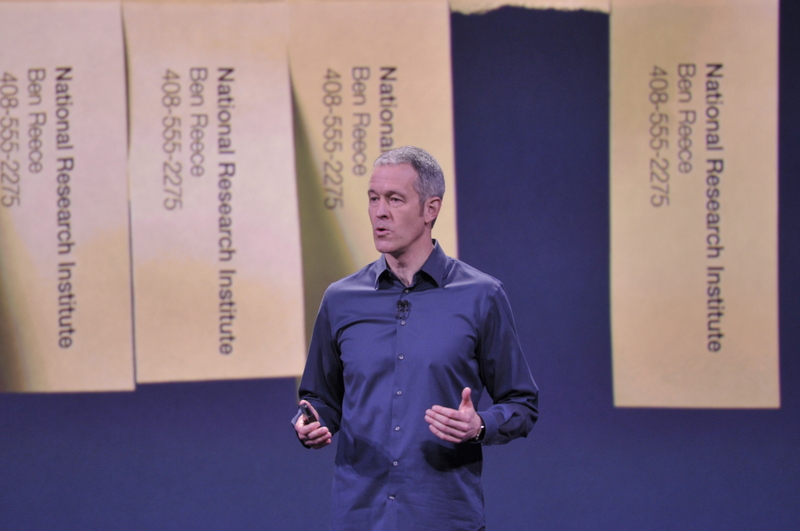 It allows researchers to create apps, allowing the iPhone to serve as a diagnostic tool. 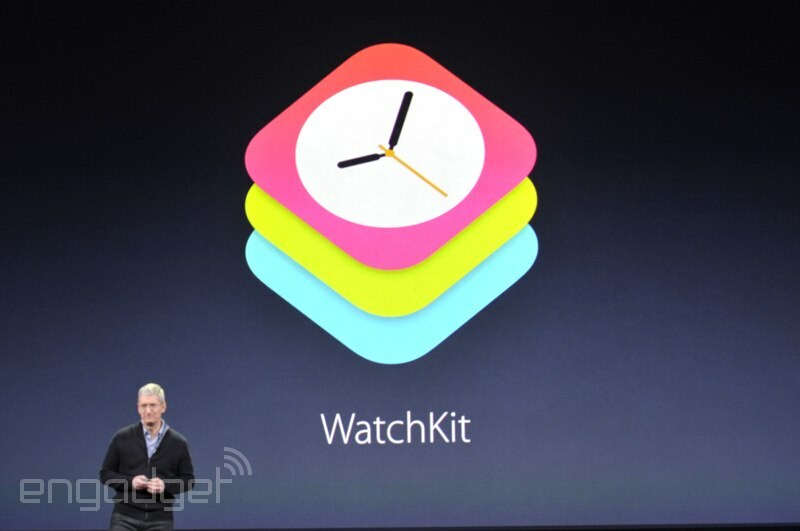 "Today, we're proud to announce ResearchKit." "We all know the reality is disease symptoms ebb and flow daily, and sometimes hourly." Worst of all, there's a communication challenge. It's just a one-way flow of communication while the study is going on. "We looked at these studies and saw a way to help." We're getting into some statistical data nitty-gritty here, which is both exciting and curious -- where are we going with this? One of the biggest challenges researchers have is recruiting, he says. They often have to pay people to participate, which doesn't give you the best cross sample of the population. Even then, you end up with a small sample size. Another issue: subjective data. "I know medical research is not what you were expecting." 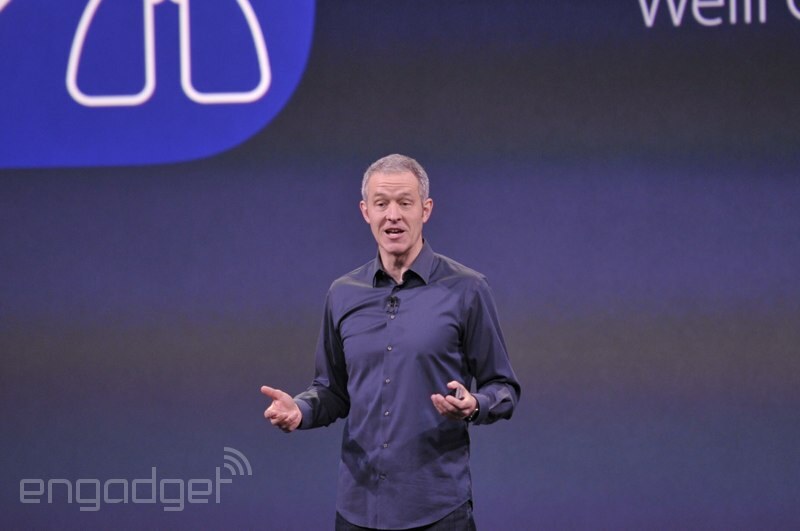 To tell us more about that, senior Apple exec Jeff Williams is taking the stage. Tim also wants to update us on the Health app. "We have always wanted to make the biggest difference we could make." That's in medical research, he says. 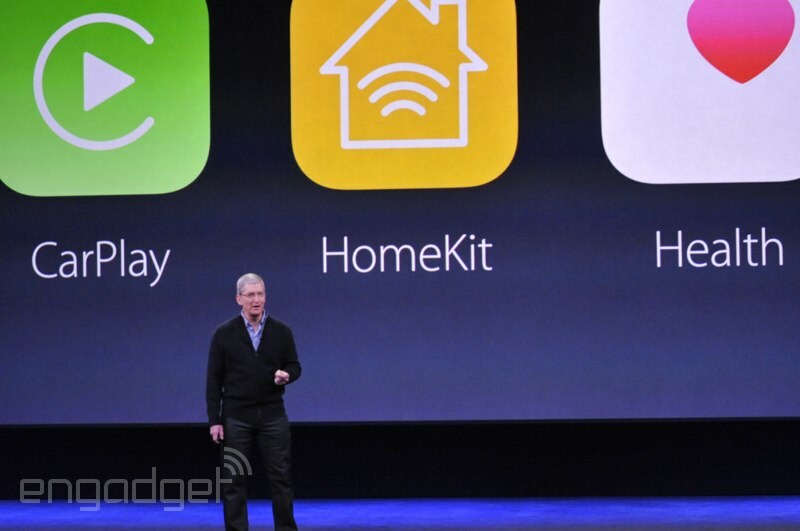 Meanwhile, an update on HomeKit. 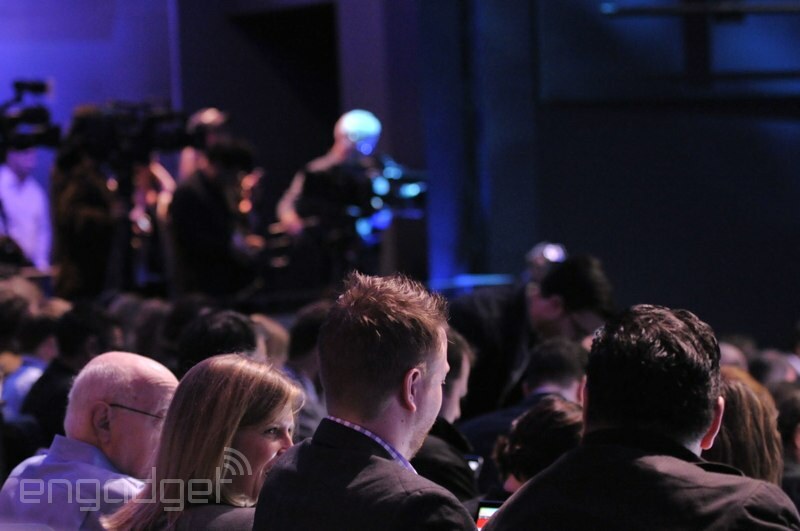 Well, not an update, just a reminder that many companies pledged at CES to support it. Onto CarPlay. 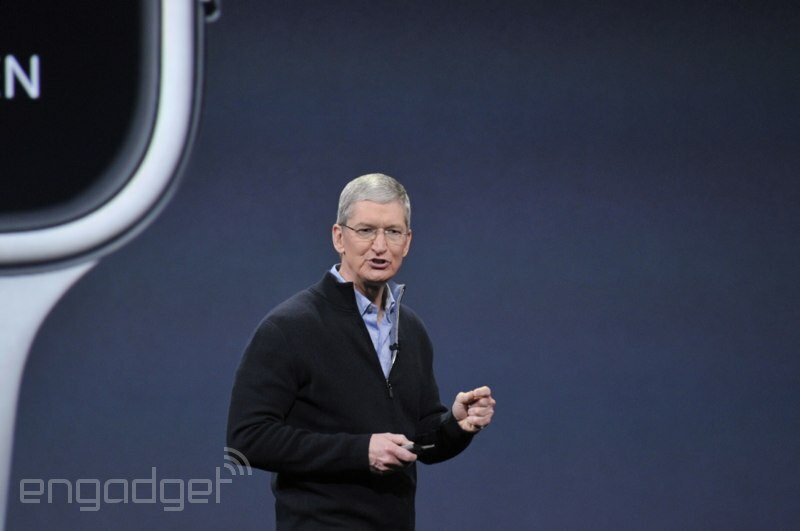 Tim Cook says every major car brand has committed to it. 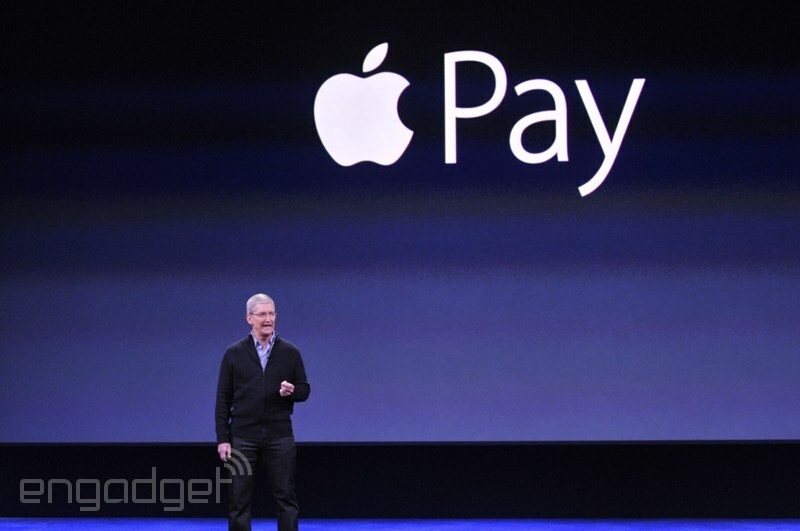 Given Tim's talk of Apple Pay and his earlier focus on China, I can't help but hope for UnionPay support some day. 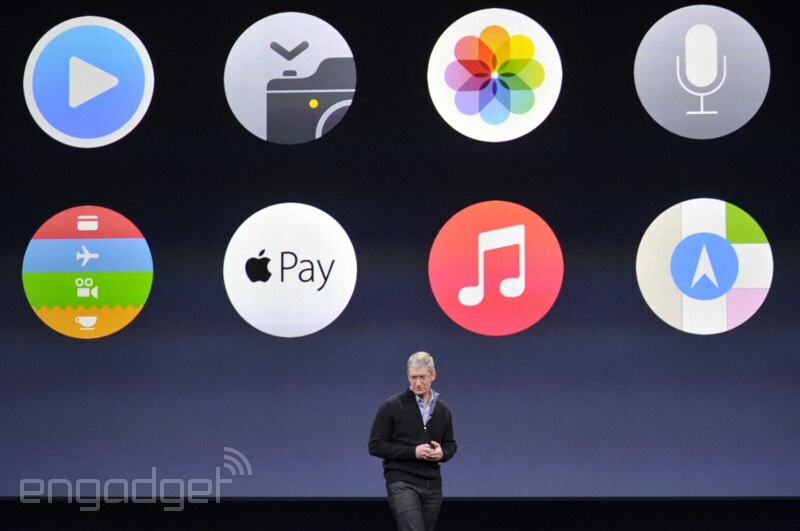 "That is Apple Pay forever changing the way we pay for things." 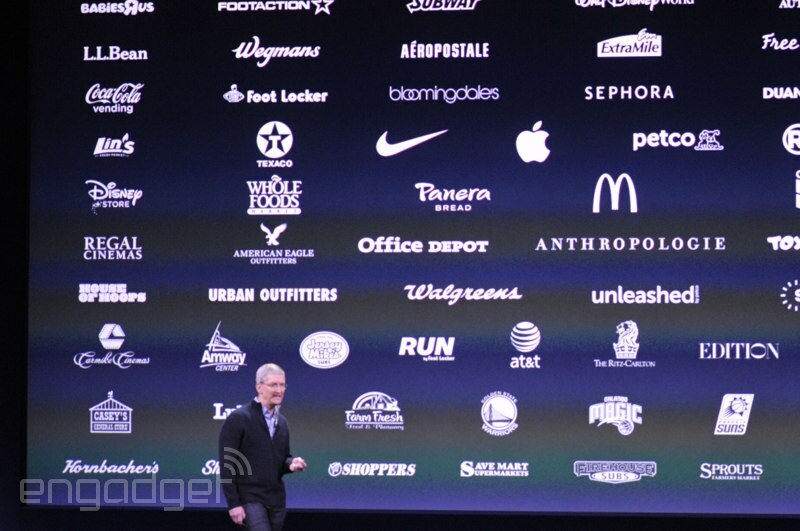 Nearly 700,000 locations (retailers, et cetera) accept Apple Pay. That includes vending machines, including some from Coca-Cola (up to 100,000 Coca-Cola machines by the end of the year). 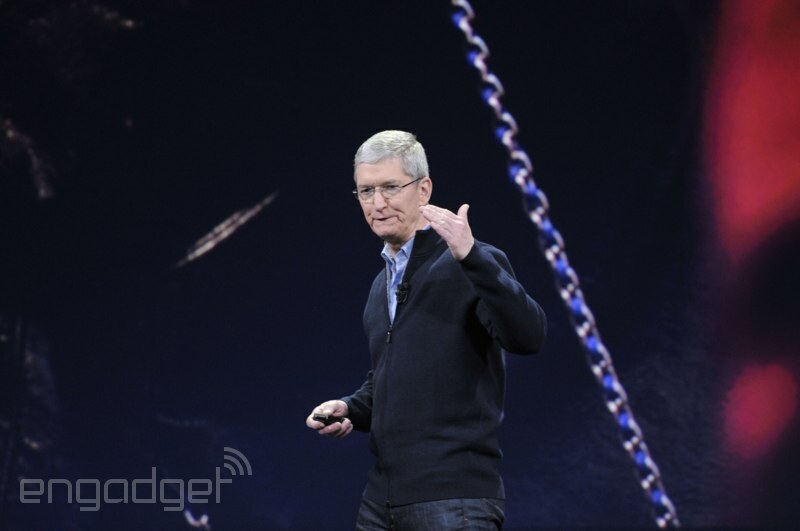 In particular, Cook claims people are happy with Apple Pay. 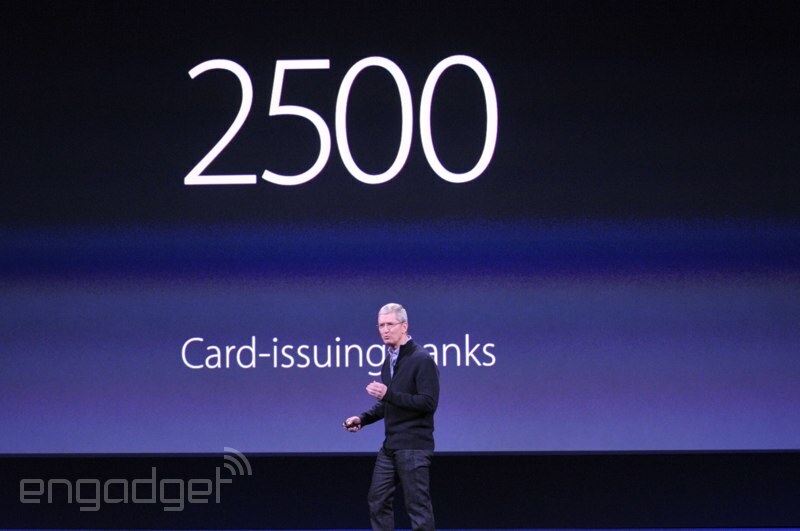 Speaking of... 2,500 banks now support it. 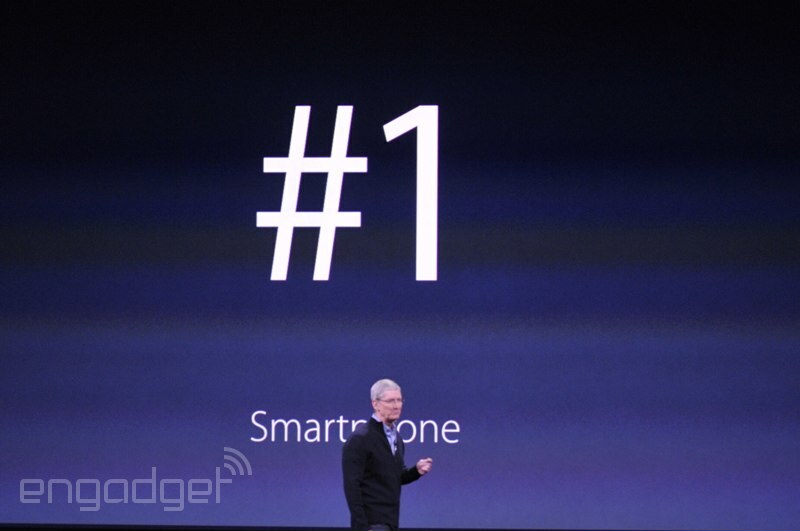 Cook reminds us that the iPhone is the top-selling smartphone in the world. 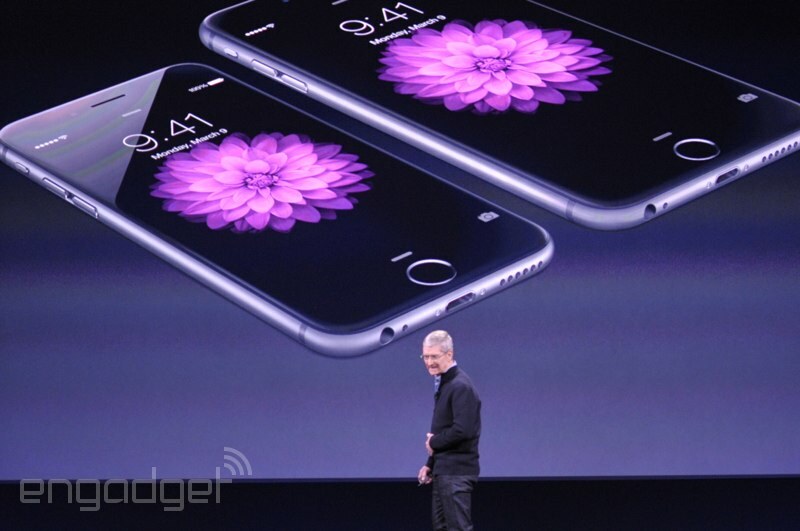 But, he says, Apple is most proud of the 99 percent customer satisfaction rating for the iPhone 6 and 6 Plus. 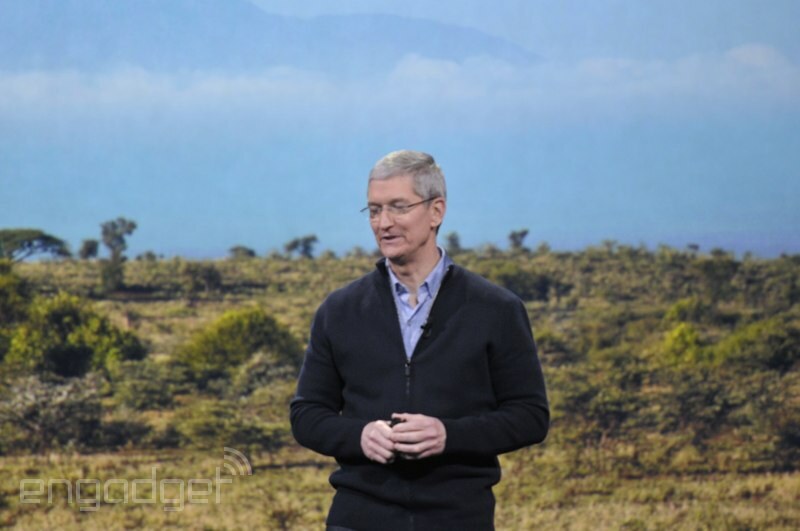 Apple recently sold its 700 millionth iPhone, Cook says. There is literally no excuse for every Airbnb host to *not* have an AppleTV now. 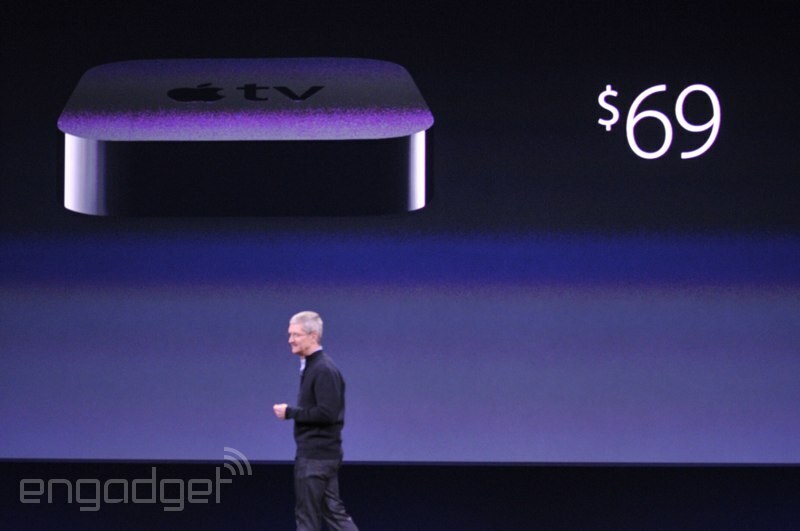 Apple TV is now $69. 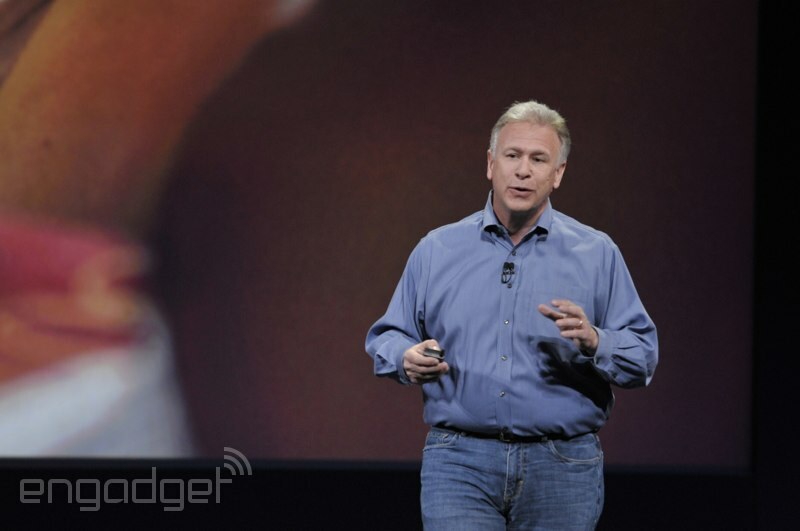 25 million Apple TVs sold -- so much for it being a "hobby"
Man, what a way to begin the keynote. 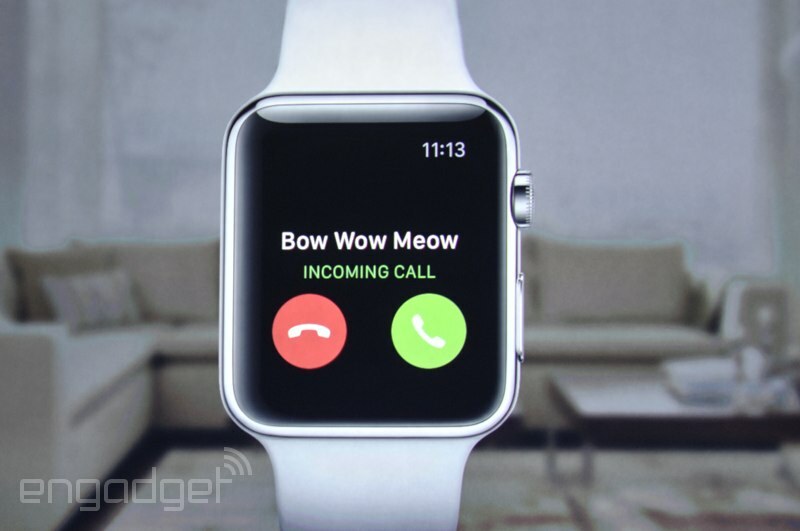 We haven't even gotten to the Apple Watch yet. 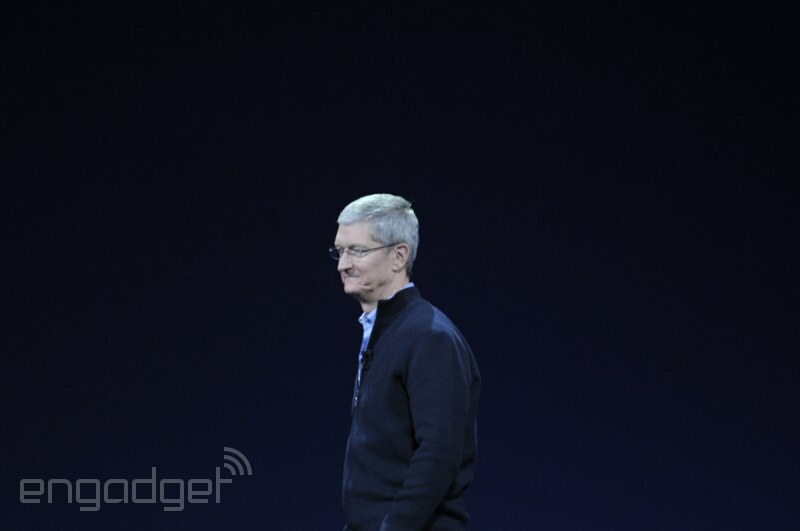 Video's over, lights back on and Tim Cook is back on stage. Winter is, in case you were curious, still coming. Time for a "Game of Thrones" trailer, just to whet our appetites. And with that, HBO CEO drops the mic and leaves the stage. 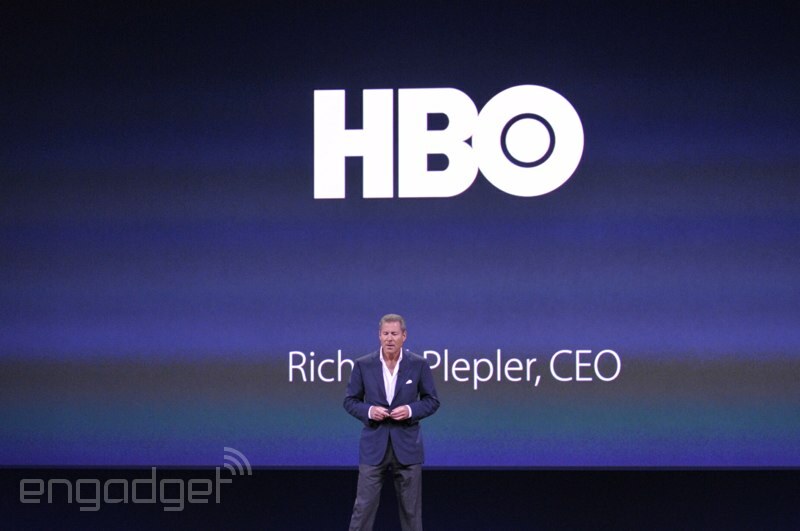 "This is a transformative moment for HBO." Coming in early April for $14.99 a month. Let me be the first to say WHAT? Don't think any of us expected to see this today. Access to all programming -- past, present and future, he says. 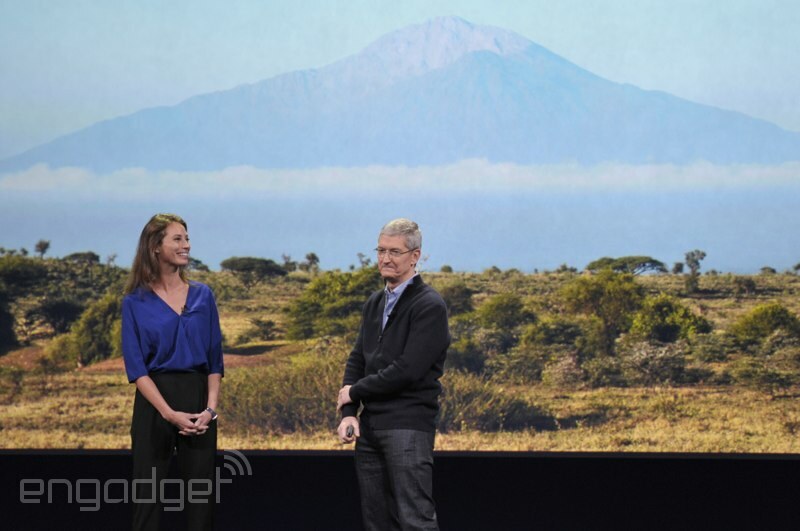 It is exclusive to Apple TV at launch. 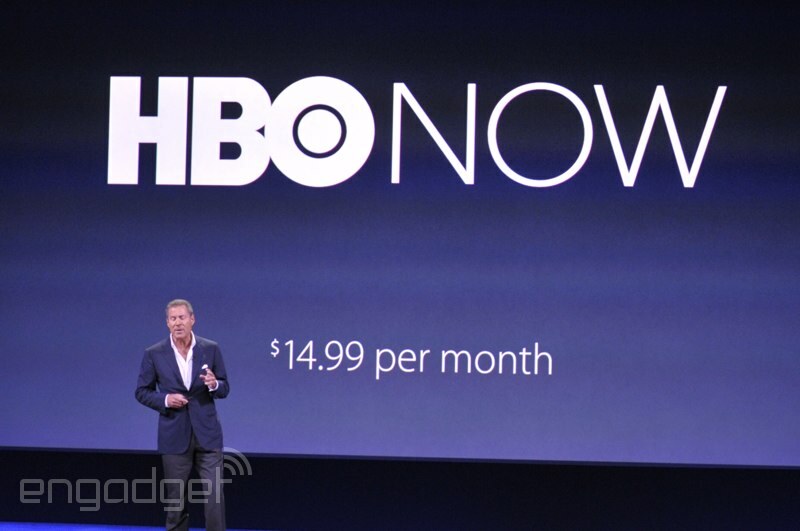 HBO Now is HBO's streaming service. 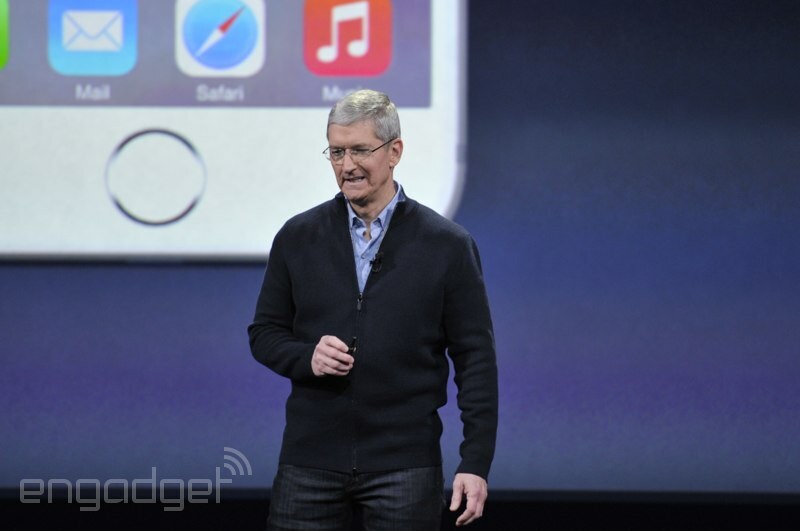 "Let me return your compliment by saying we love Apple," he begins. 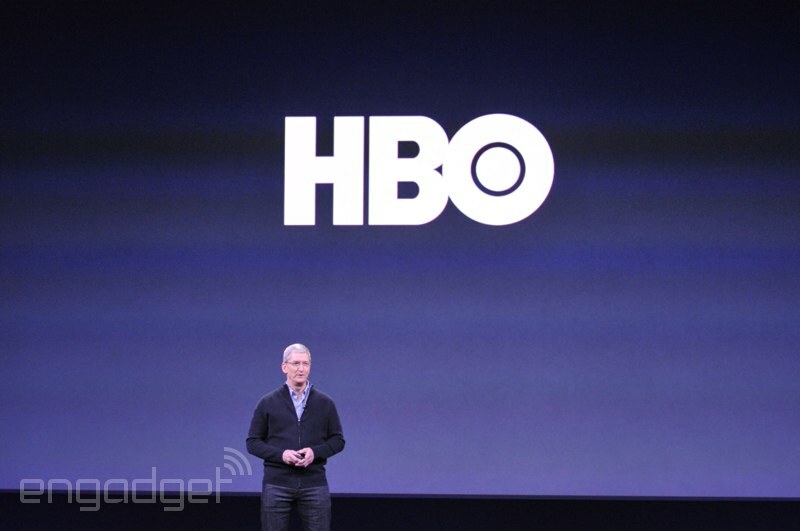 "We love HBO." So do we -- what's the deal, Tim? 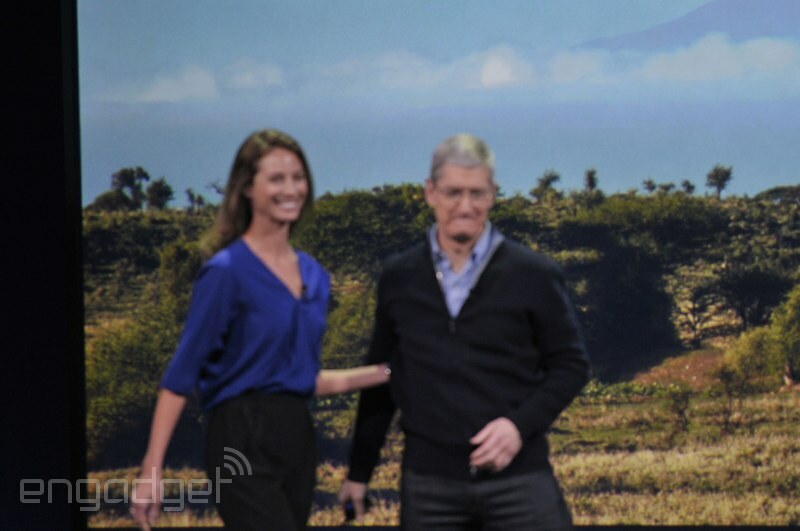 Tim Cook is cutting right to it. 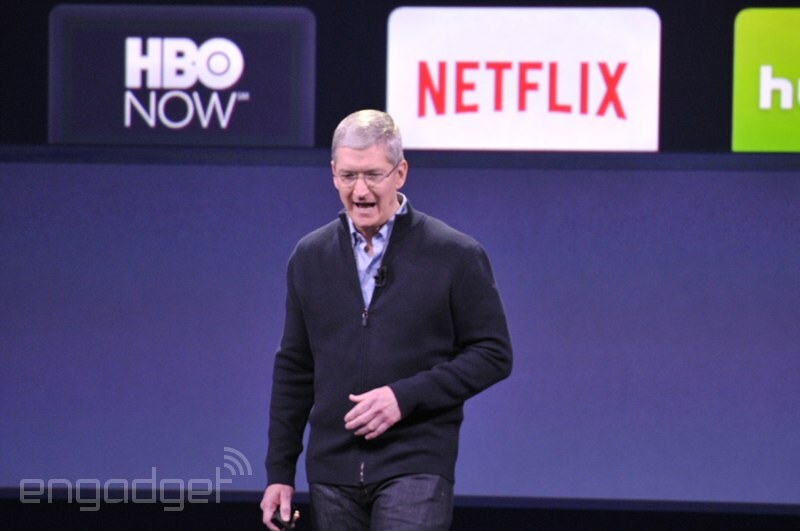 He wants to tell us about HBO on Apple TV. "We have a few more reasons for you to visit those stores today." 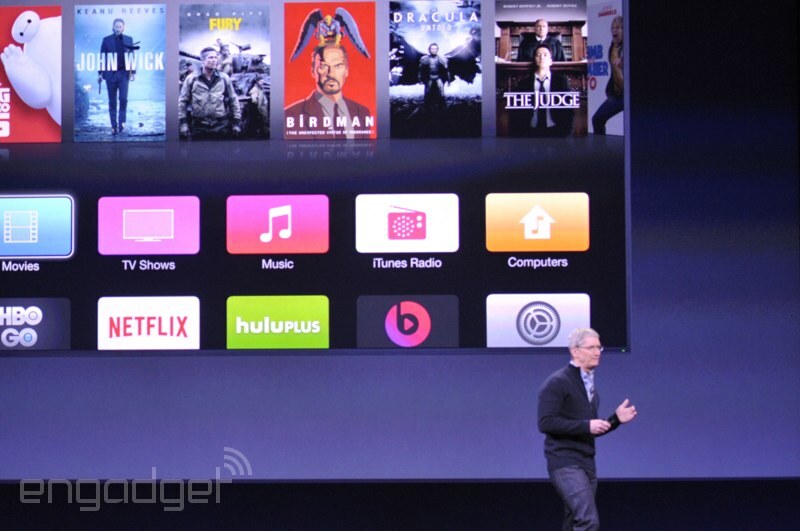 Starting with Apple TV. 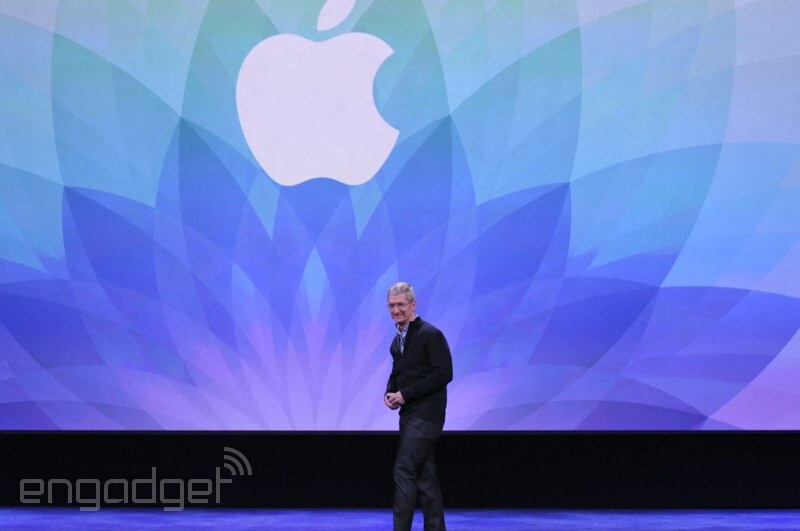 120 million customers visiting Apple Stores earns a burst of applause. 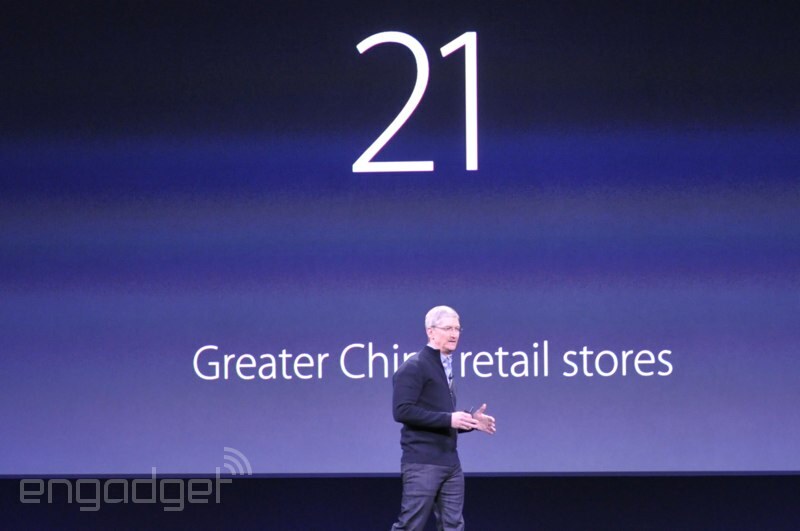 Tim cook expects 40 stores in China this year. 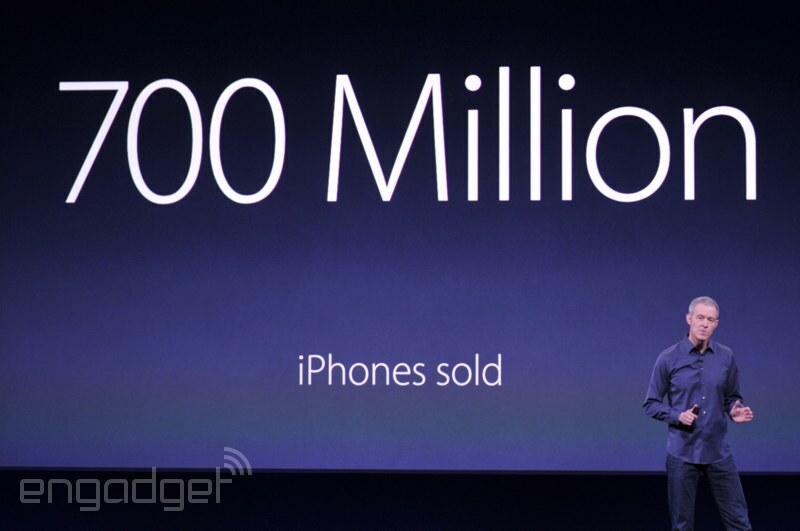 Never question that this is a huge market for Apple. 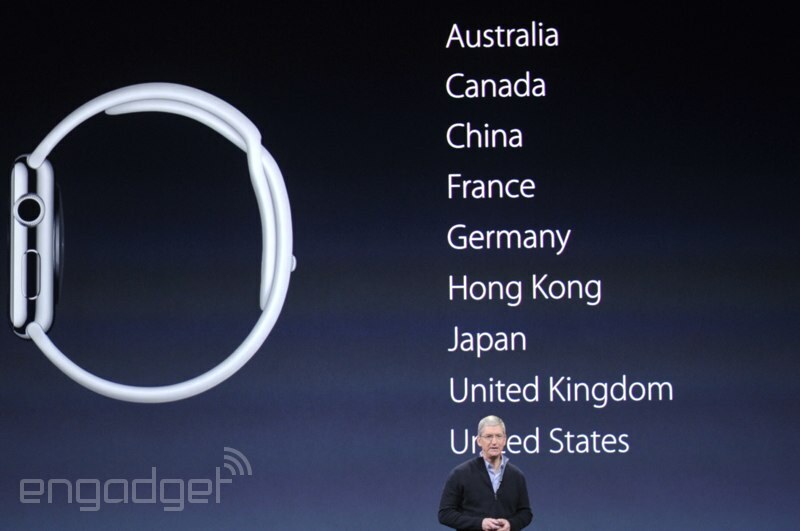 Apple has opened six new stores in China in the last six weeks alone. Hot damn. "What you just saw in that video was the opening of our latest store." 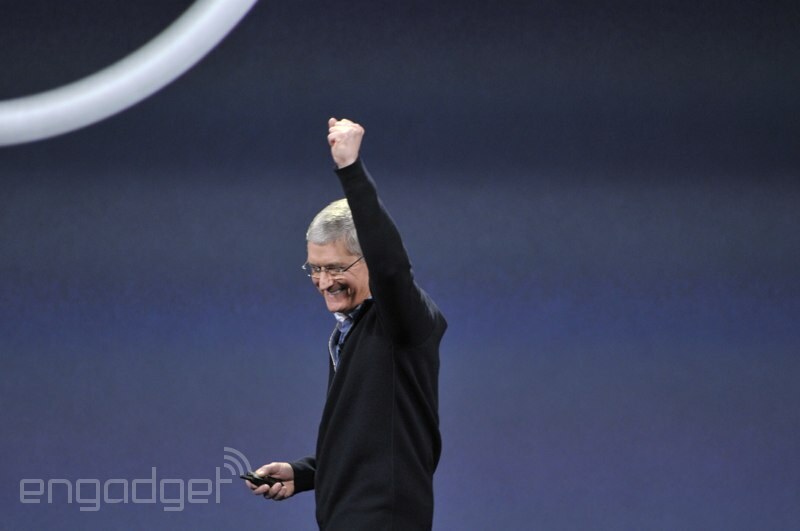 Lights up, Tim Cook, big applause. 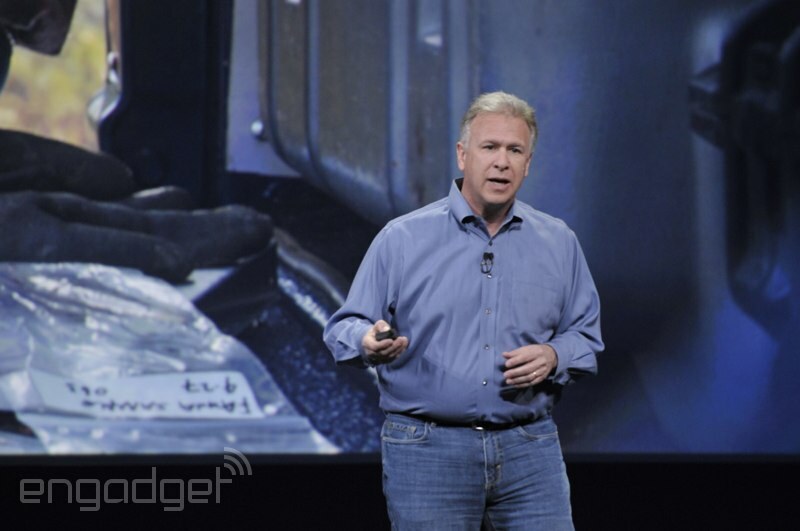 The uniformity of Apple Stores is almost as comforting as, say, McDonald's. The store on Fifth Avenue feels like the store in Barcelona, which feels like the store in Hong Kong. 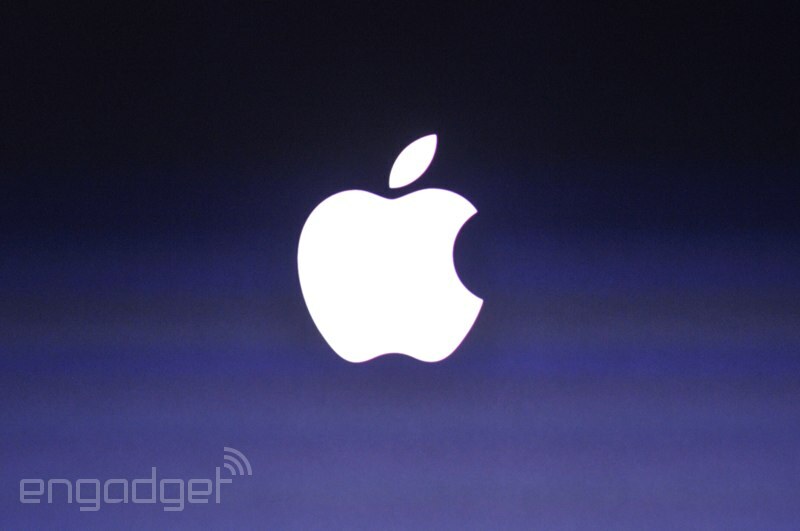 Apple's opening with a video, as it often does. 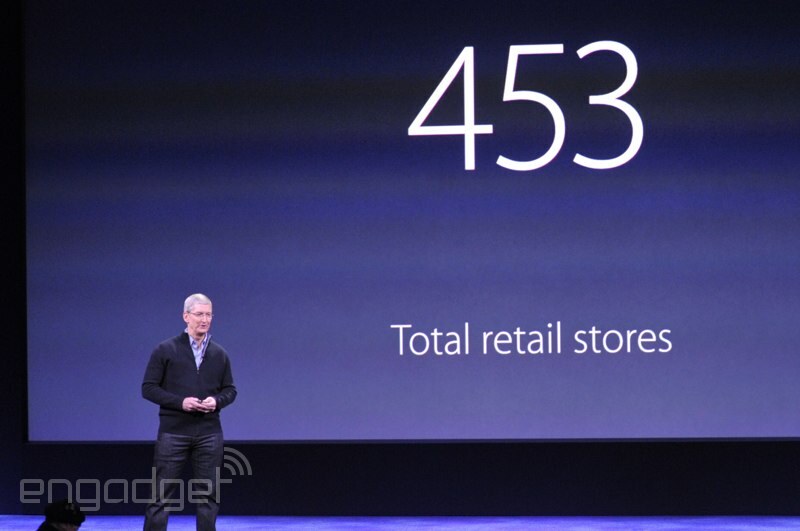 A video of Apple Stores around the world, it looks like. Lights dimming! Let's do this! Or maybe Muse! If we're really lucky, we just might get another sincere/awkward finger-touch moment. Great acoustics too. Maybe U2 will show up again? Pretty cavernous space we're in here, especially compared to the events at Apple's Cupertino campus, which have a much cozier feel. We're not exactly up against the stage here, but we've got a clear shot of the stage, and Michael's shooting with a honking 70-200mm zoom lens, so we should be all set. In case you were wondering, yes, I've actually been knighted, and yes, it's as great as it sounds. I'll be running our liveblog today, with Mr. Gorman on photos and Sir Velazco doing color commentary. Hello, hello! We're live from San Francisco's Yerba Buena Center. 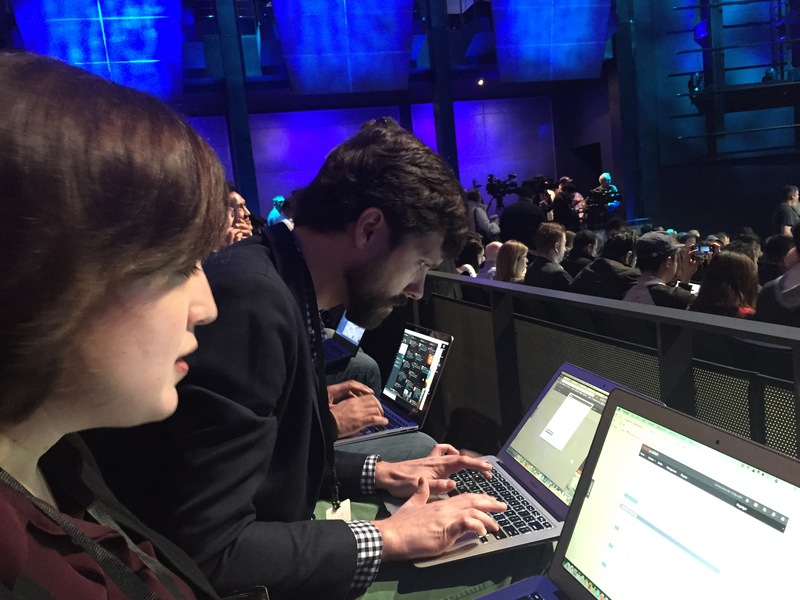 I'm seated here with Michael Gorman, our editor-in-chief, on my left, and Chris Velazco, our senior mobile editor, on my right.